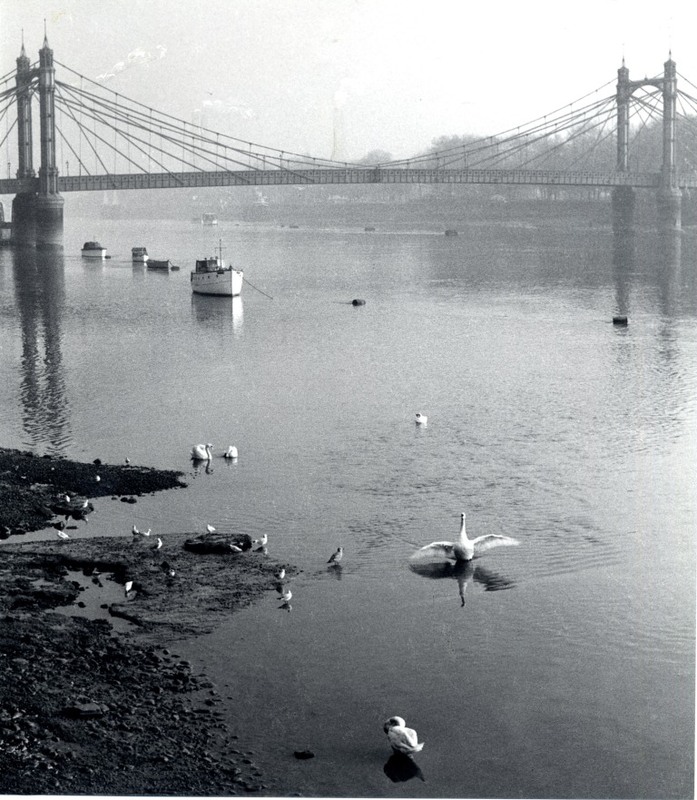 I was looking through some old proof sheets for John Bignell’s book Chelsea seen from its earliest days (enlarged edition 1987 but now out of print), in which Bignell contrasted his own photographs with equivalents from an earlier era. I decided to use some of the old photographs in a post but couldn’t think of a unifying theme. Then we got an email enquiry about the effect of that “structured” reality TV show set in Chelsea on the real borough. (Short answer: none at all probably.) 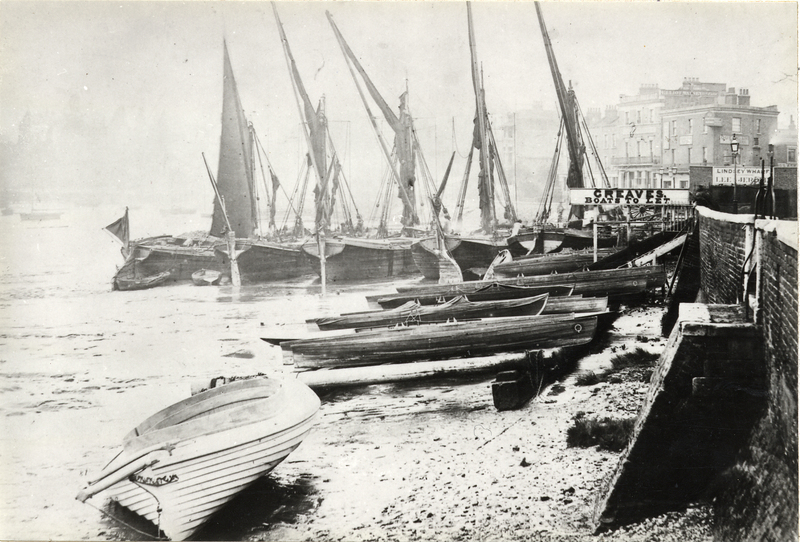 And so I had a title for a random selection of images of Chelsea as it was in the late 19th and early 20th century. The first image is probably the oldest. We begin as Chelsea itself did on the riverside. 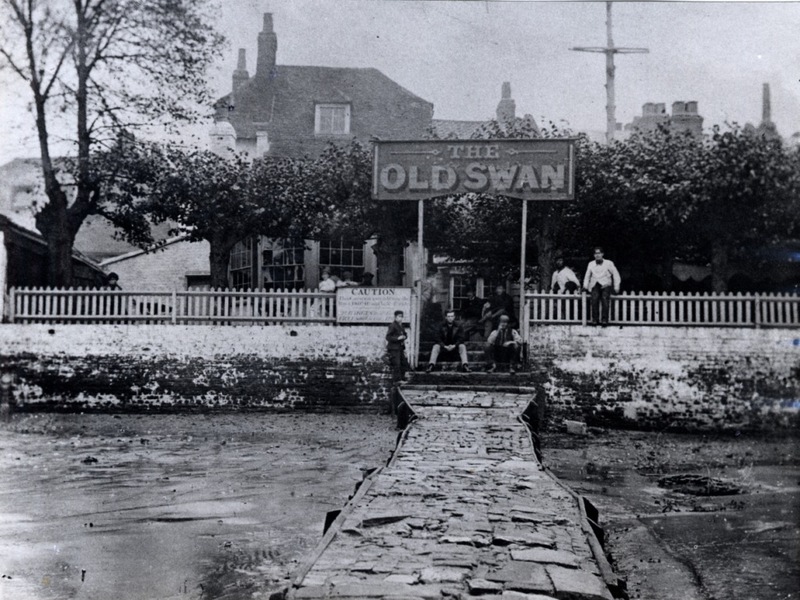 This is the Old Swan Tavern, before the Embankment, at low tide I would assume judging from how far back the photographer is standing from the river steps and the obliging patrons. I think this is a James Hedderly photograph. The Old Swan lay at the end of Swan Walk near the Physic Garden. This of course was not the original Old Swan but I don’t want to make things too complicated (for myself) at the moment. There are some paintings of the Old Swan in this post. I’m following a winding path through Chelsea east to west, south to north taking in high and low society. This entails a few leaps back and forth in time. 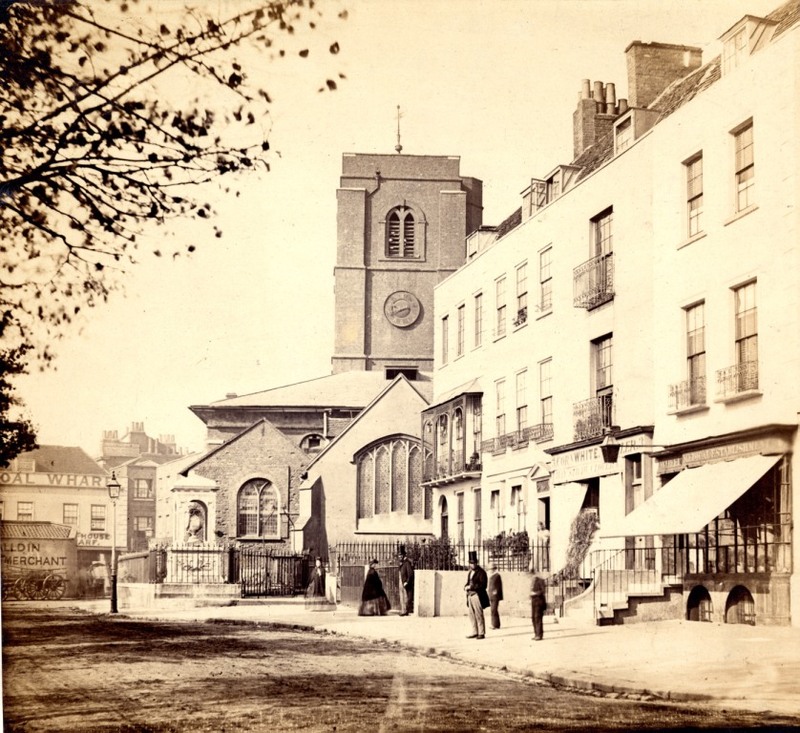 This picture is a distinctly post embankment view of Lombard Terrace, which lay to the west of the Old Church. The distinctive art nouveau buildings on the left are 72-74 Cheyne Walk, designed by C R Ashbee. 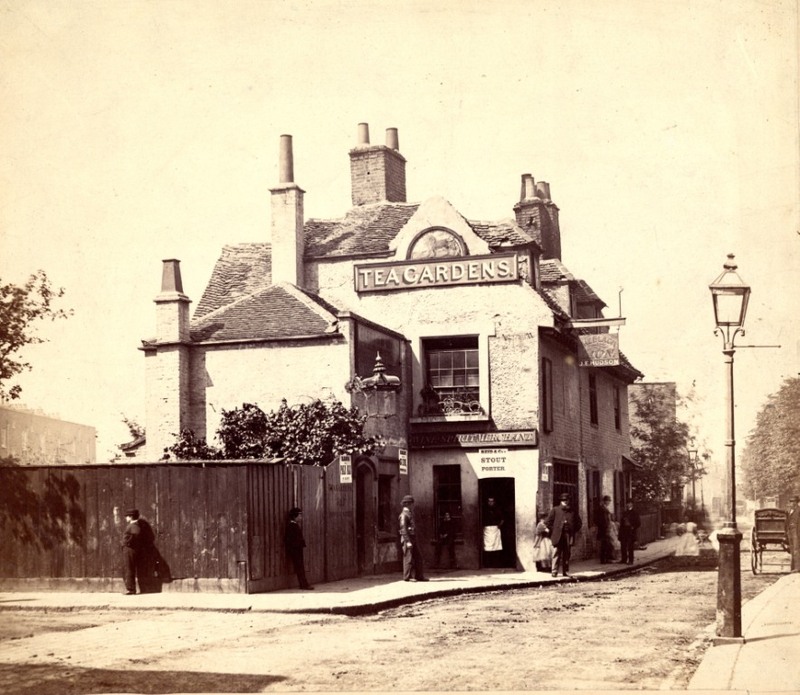 They were built on the site of Maunder’s fish shop, a building painted by many, including Whistler which is appropriate as number 74 was the last house in which he lived. 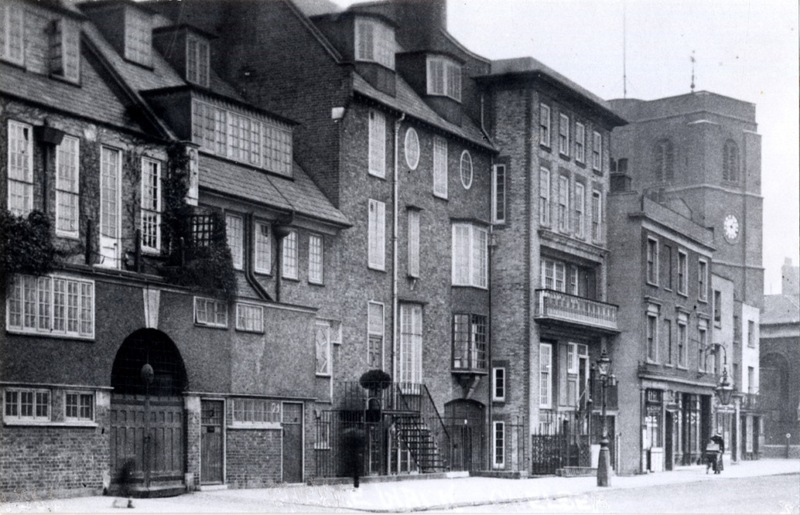 The building was demolished by 1927 and the fight to save some of the remaining houses was one of the causes around which the Chelsea Society was formed. Whatever was left was destroyed along with the Old Church in an air raid in 1941. 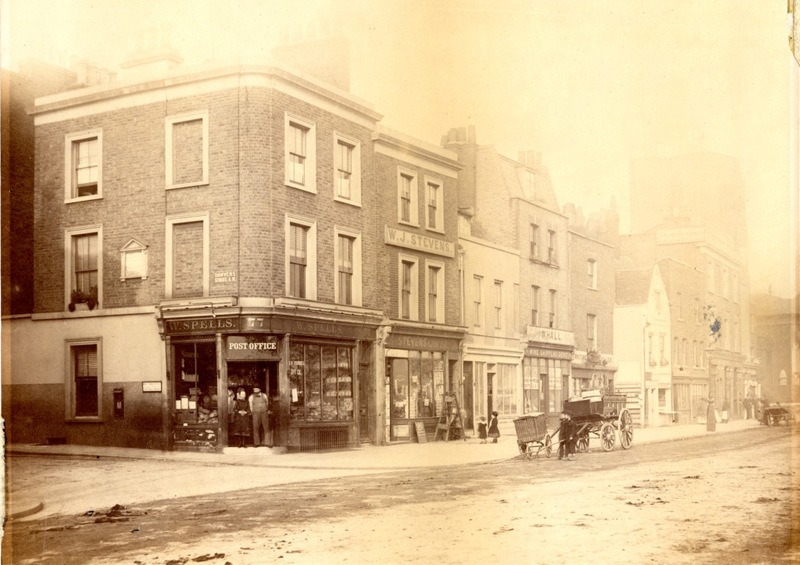 The picture below shows part of the original Lombard Terrace with Mr Spell’s Post Office and store on the corner of Danvers Street. I think that’s Mr Spell and his daughter standing in the doorway. This is another picture by James Hedderly. I’d quite forgotten this picture so I was quite struck by this view looking north from Battersea Bridge up Beaufort Street. 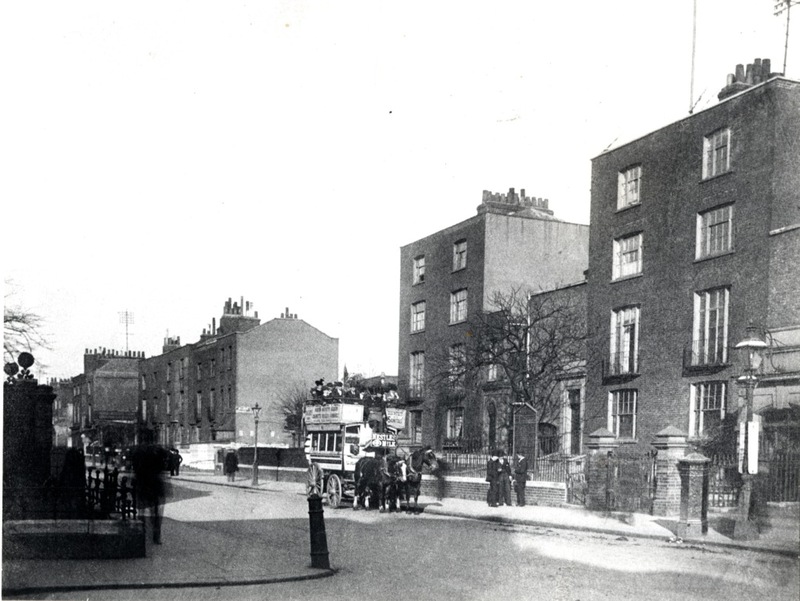 Belle Vue House on the left remains and the terrace of tall houses beyond, but on the right all the old houses of Duke Street have gone. We’re not quite finished with Cheyne Walk. Let’s take a walk past the King’s Head to the pleasingly named Aquatic public house. 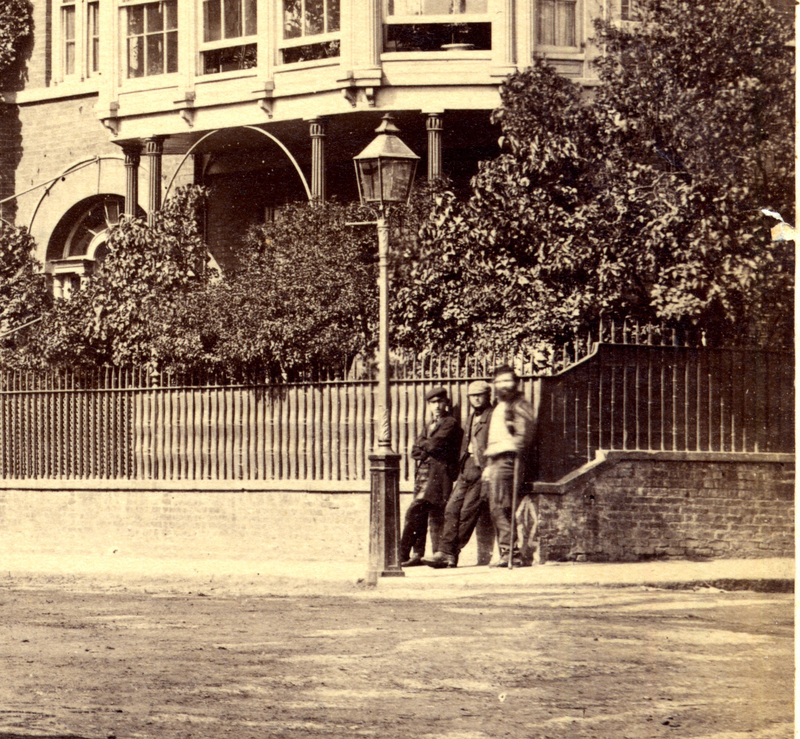 The three boys are just about to reach the house with the balcony rail on the roof line, where JMW Turner lived. We saw a picture of it by Thomas Hosmer Shepherd in a previous post. If we turn back back and go up Beaufort Street we can cross the King’s Road into a quiet cul-de-sac called The Vale, where William and Evelyn de Morgan lived. We don’t know who the lady is, but she looks quite comfortable. A horse bus on the King’s Road, at the corner of Sydney Street, pretty much where the Old Town Hall (and Chelsea Library of course) are today. 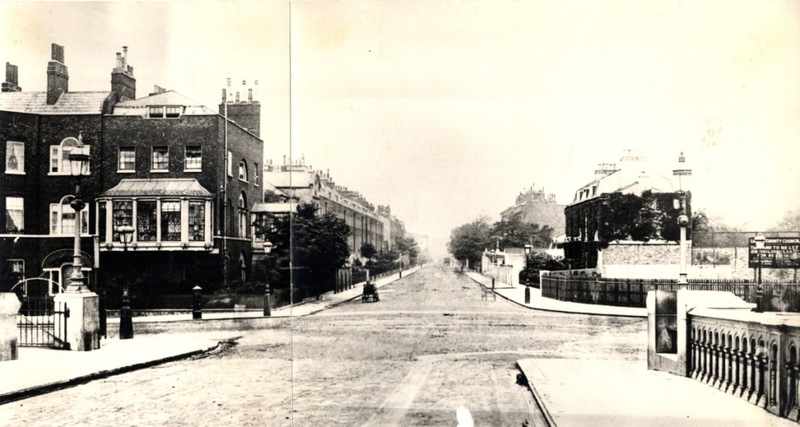 The King’s Road still had many purely residential houses along this stretch. We can take a short detour down nearby Oakley Street to take a look at one of its famous residents. The good Dr Phene strikes a pose outside the house in which he never actually lived. He only had to go across the road to his actual house. Read more in this post. 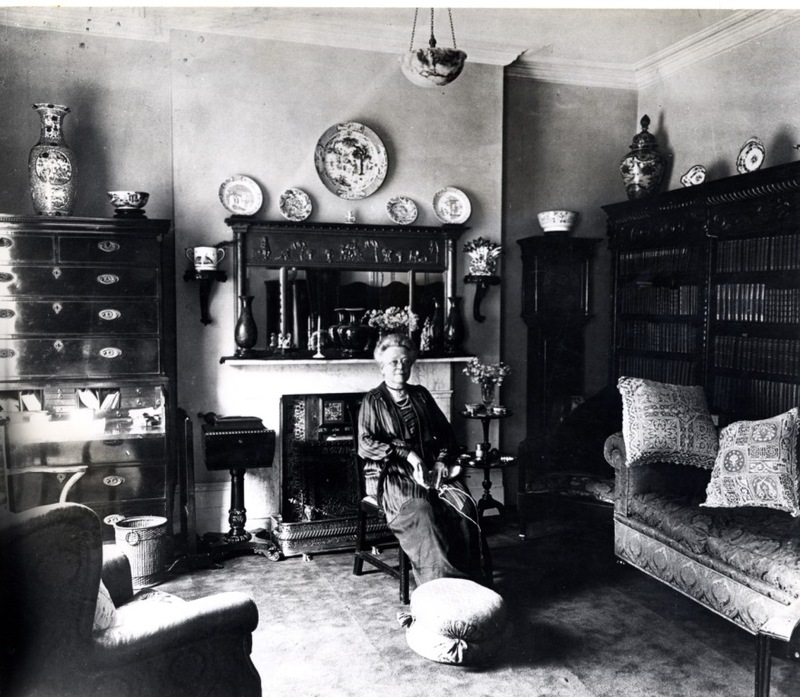 It’s a fact that I’ve never been able to use on the blog, but another local resident I’ve written about, Margaret Morris once took a party of local residents on a tour of the house. I don’t suppose the two of them ever met but I’d like to imagine they did. Speaking of my personal obsessions here’s another one, a photograph showing the teacher training establishment Whitelands College, home of the May Queens. Behind those walls lay a unique story, which I have covered here and here. (You can probably expect another one in April). Readers of History Today (February issue) can see a rather disturbing photograph of the college quadrangle a few years after the Staff and students moved to Putney. 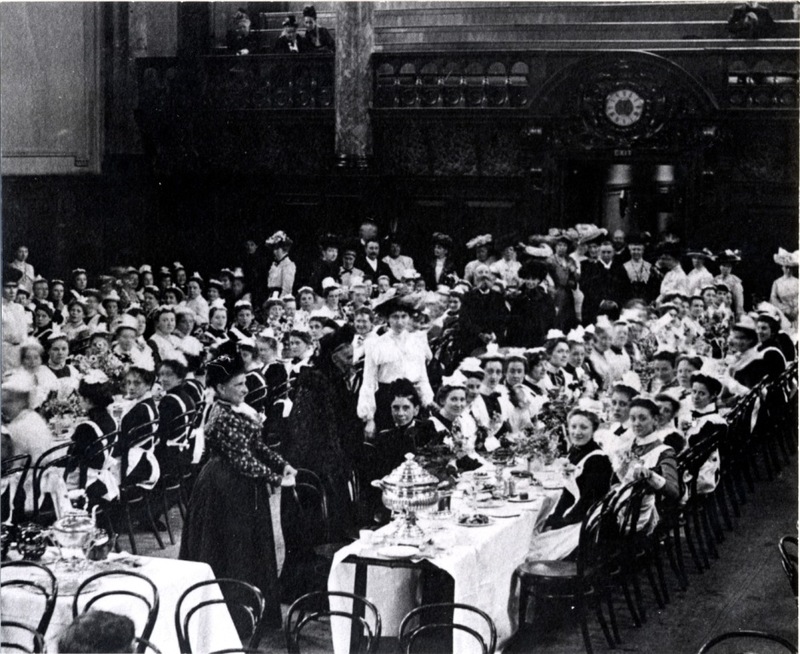 I promised you a bit of high life so here is a picture of the King’s Dinner held in Burton’s Court in 1902 as part of the celebrations for the coronation of Edward VII. The idea was that the poor of Chelsea would be served by charitable members of high society. The lady in white is clearly doing her best but apparently the whole affair was a bit of a disaster, with not enough food, general bad behaviour and insulting language used against the lady volunteers, some of whom had to flee the scene. And everyone went home with a gift bag. 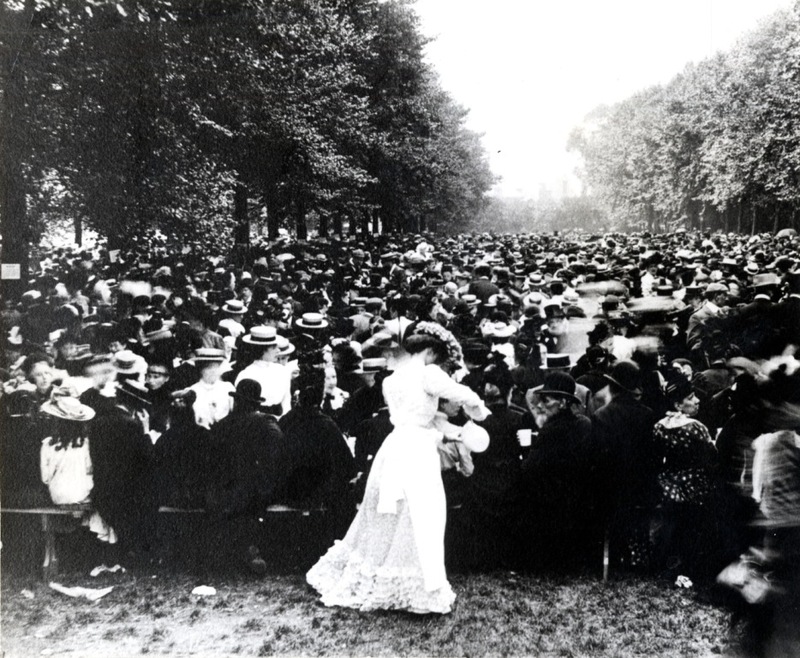 The Chelsea Flower Show was always a big social event, attended by the highest in the land. 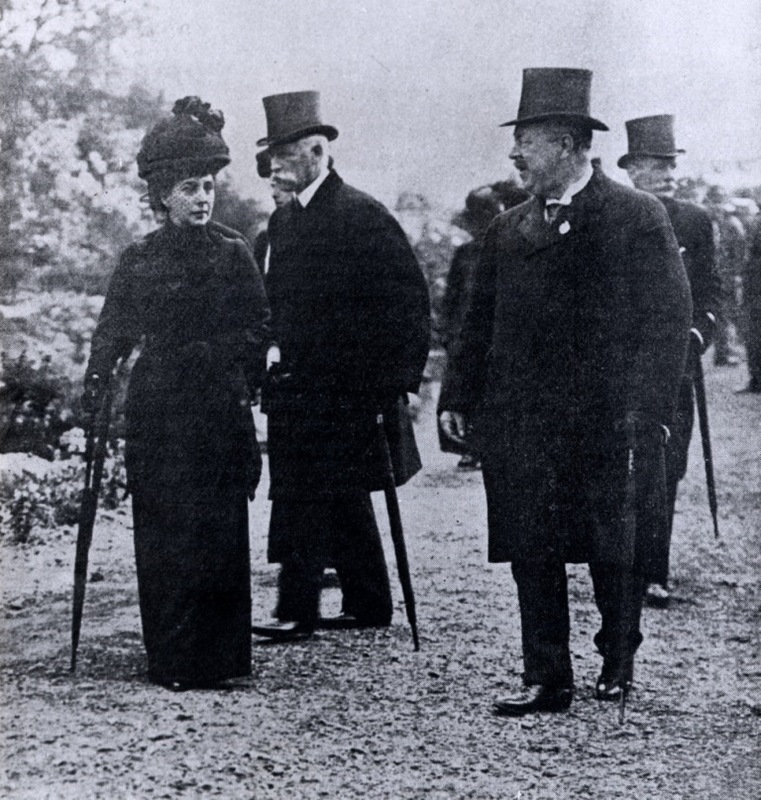 Queen Alexandra in 1913 accompanied by some important men. But let’s go back to ordinary life. 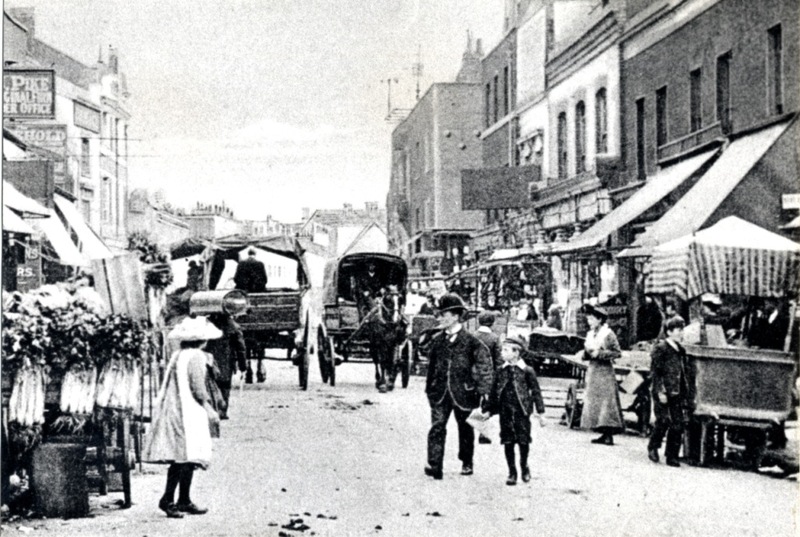 This is the street market in Marlborough Street. The shoppers of 1900 look pretty smart. 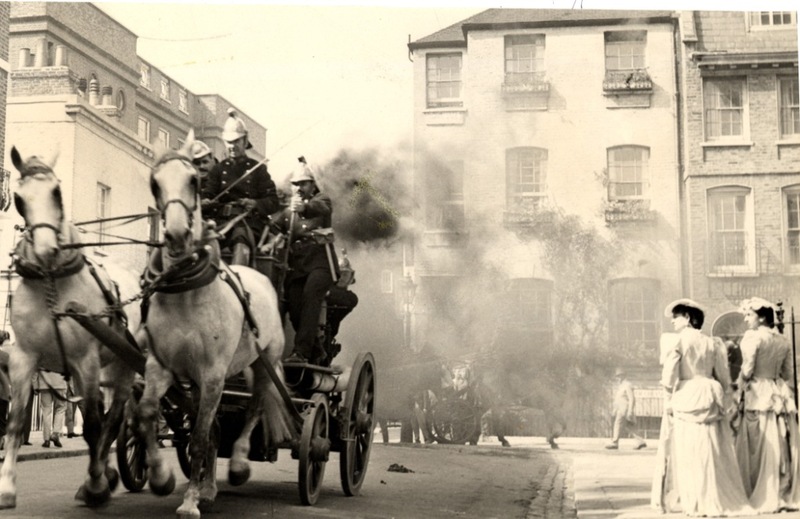 Finally a picture in another Chelsea street, Upper Cheyne Row showing a horse drawn fire engine. Is there something wrong here? I’ll leave that thought with you. I think I must have set some kind of record for the number of hyperlinks I’ve inserted into this post, so just ignore them if they irritate you. I balked at linking to all the Hedderly posts. Why not try the search box? And I’ve had to rush through some of the background detail so fact checking is welcome. Next week I’ll go back to a much smaller area. 100 is a special number so it deserves a special post. I can’t actually arrange a time travelling meeting between the two Chelsea photographers John Bignell and James Hedderly but I can bring them together in another way. 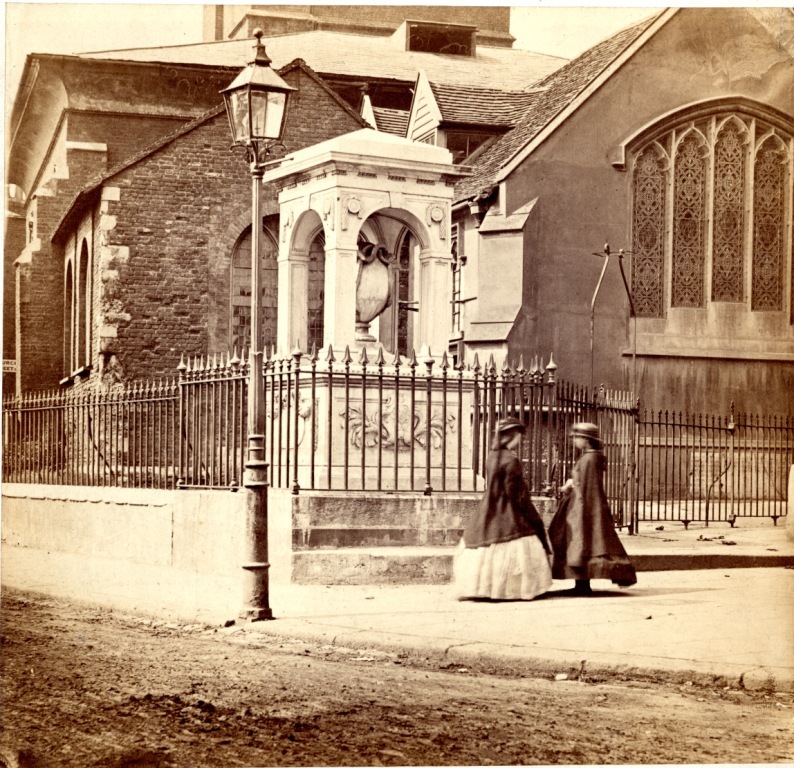 John Bignell was not only a photographer but a student of photographic history. 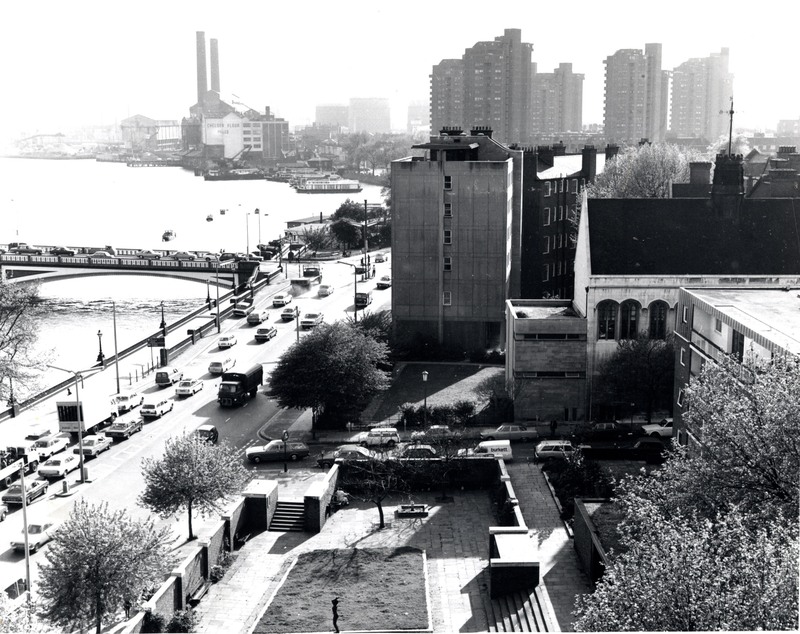 He wrote a visual history of Chelsea, “Chelsea seen from its earliest days” (1987). And he owned a collection of Hedderly photographs. On one occasion as you’ll see he recreated a Hedderly picture. But as a Chelsea photographer he literally went over the same ground as Hedderly and you can see echoes of his predessessor , conscious or unconscious, in his work. Here’s an example. 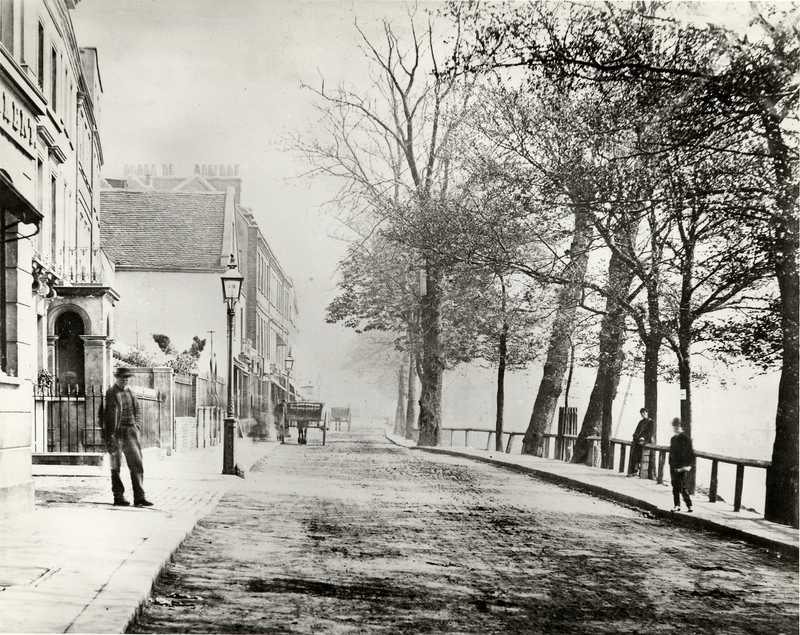 In the picture below Hedderly is looking east along Cheyne Walk in the pre-embankment days. The road is roughly paved and narrow. 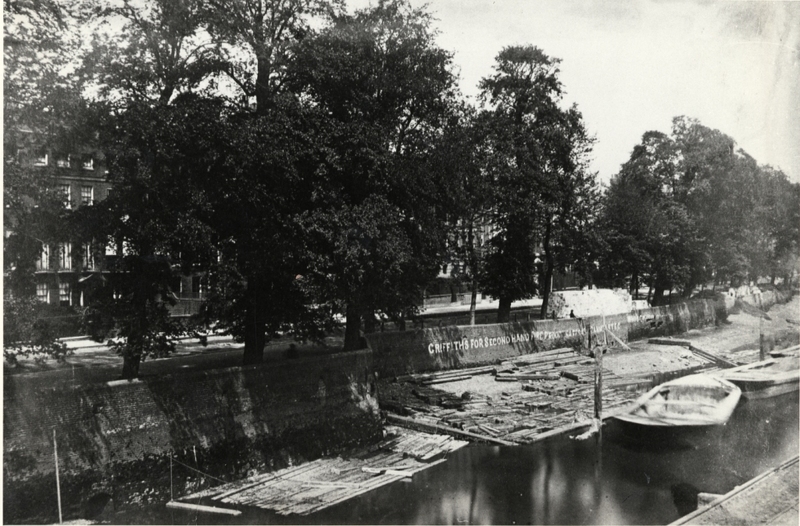 The wooden fence on the right marks the river’s bank. 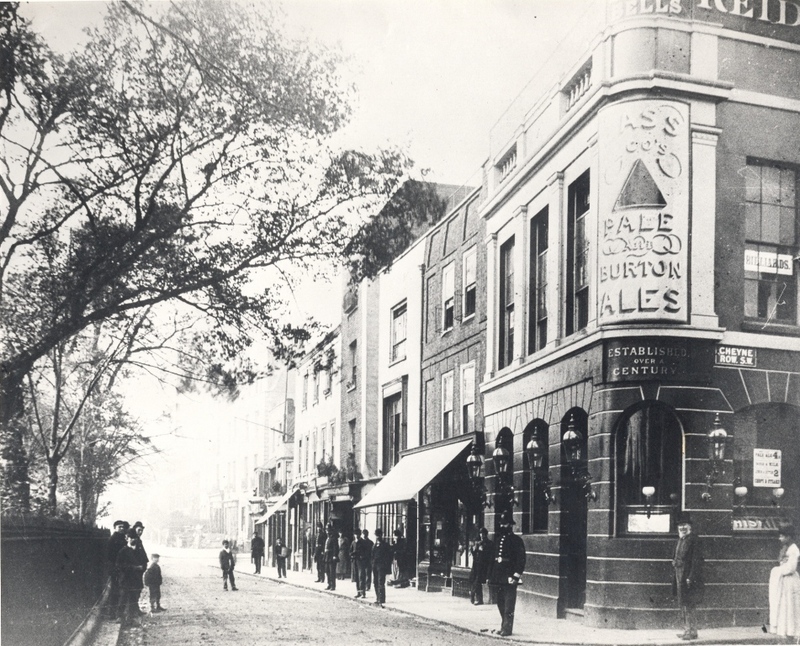 On the left you can just see the edge of the King’s Head and Eight Bells public house. The image has faded over the years so the white misty background beyond the trees may be deceptive. 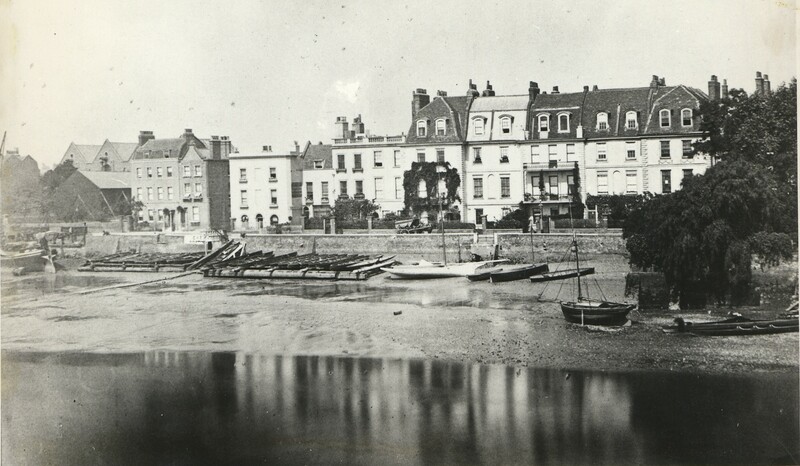 It will have gotten more mysterious as the print has aged so we may have lost some detail but you can get the quiet atmosphere of riverside Chelsea in the 1860s. 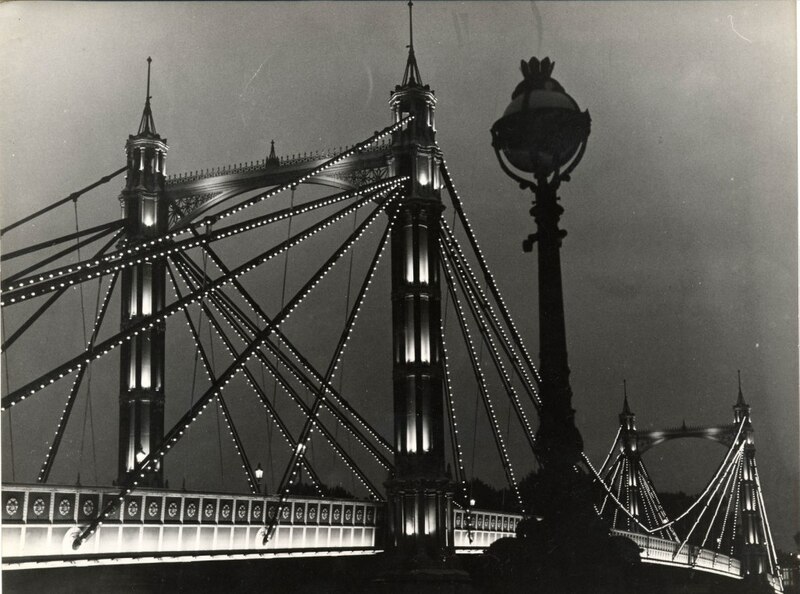 Nearly a century or so later in 1950 Bignell took this picture. The foliage is lusher, there’s a garden on the right beyond which is a very much wider Cheyne Walk. The buildings in the background have changed with the exception of that one with the ornamental porch. The lampost looks very similar too although it may have been replaced with one which looked the same. You see a little more of the pub. And of course there is a small crowd of pub-goers who have spilled out of the bar onto the street. The men look about as casual as Chelsea men got in 1950, the women slightly more so. In contrast to the 1860s picture only a couple of them are paying the slightest attention to the photographer. I wonder if the man in the double-breasted jacket is bringing a drink for Bignell. The two pictures fit together remarkably well. This is not so obvious in the next pair. 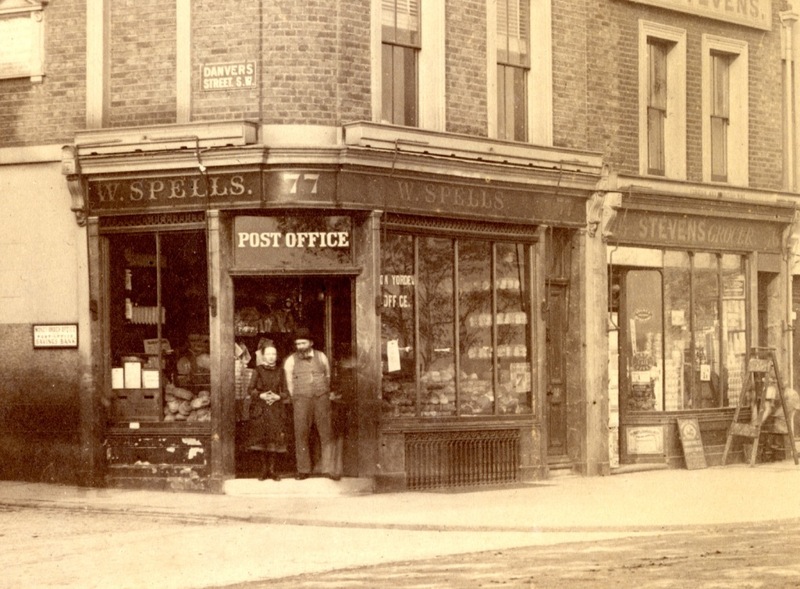 This is one of Hedderly’s rare north of the King’s Road pictures, possibly a commission. 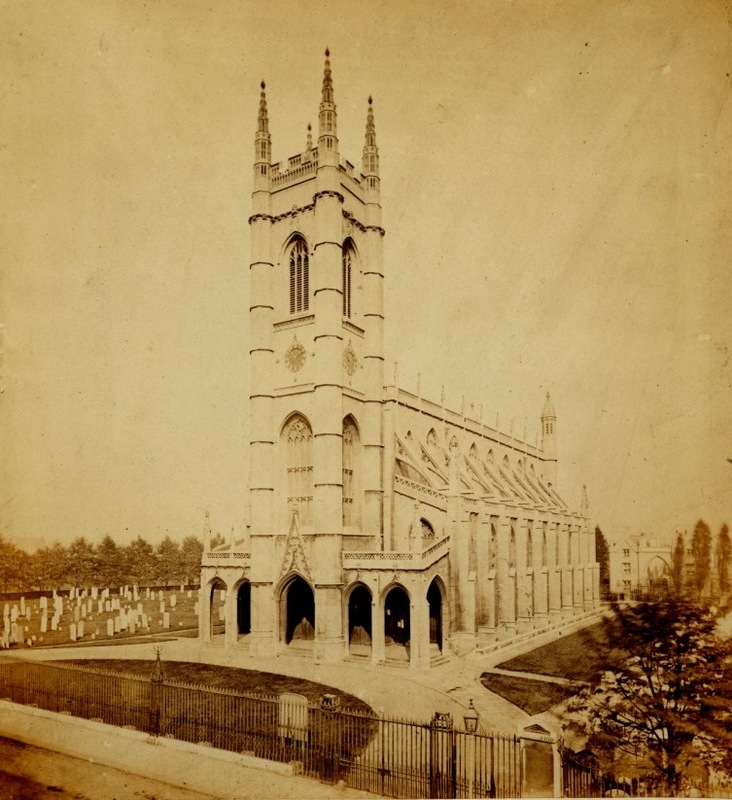 It shows the “new church” St Luke’s in Sydney Street. The church would have been thirty or so years old in this picture. 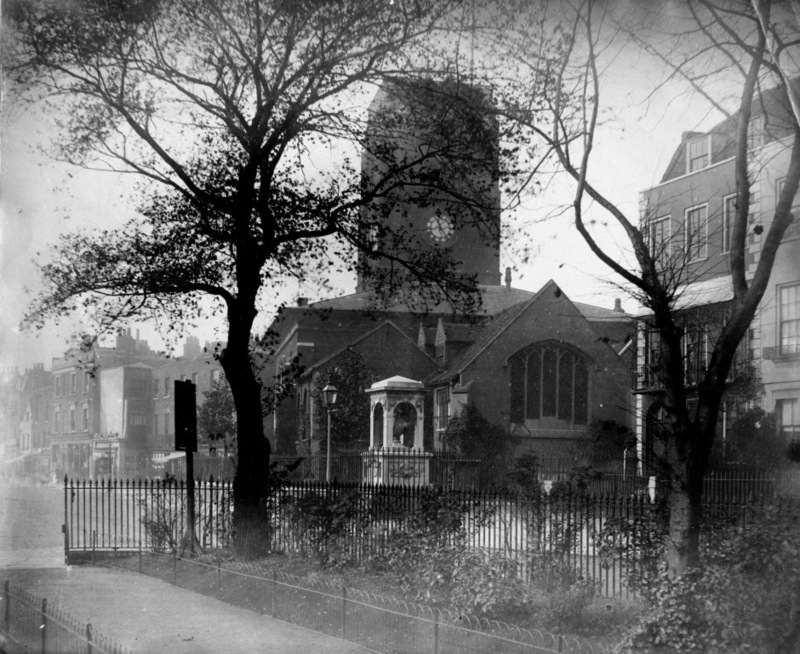 The churchyard to the left looks well populated. But the church, surrounded by trees, is still in a suburban setting. 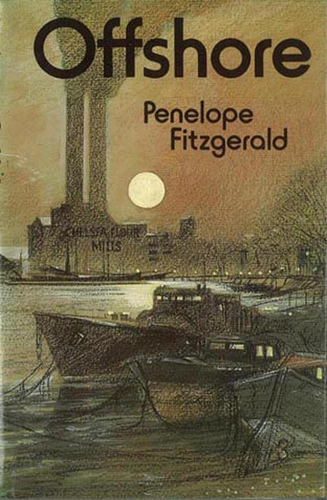 The view by Bignell shows the urban setting of the late 1950s. The trees are still there but London has caught up with the church and surrounded it. In the background you can see one of the domes of South Kensington. In the foreground however is another building Heddderly would have seen at some point in his life, the Chelsea Workhouse. It wasn’t a workhouse in Bignell’s day but you can see the forbidding nature of the place. Both photographers were fond of riverside views. 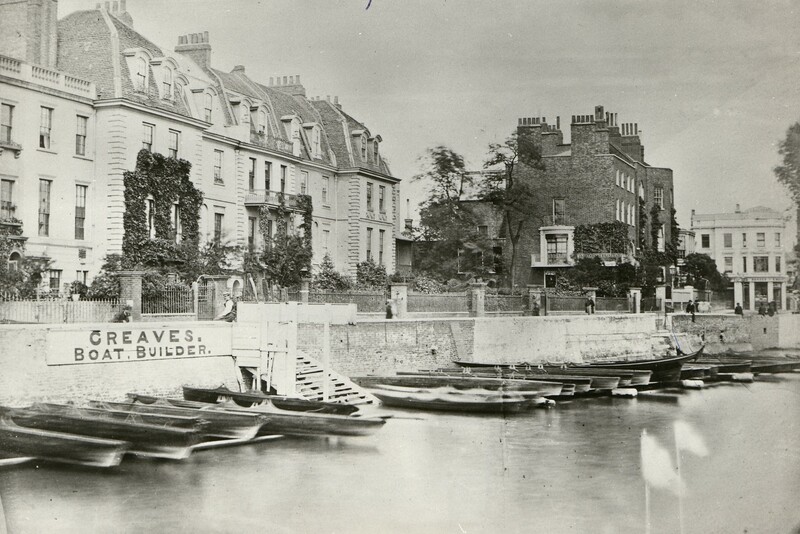 I’ve featured Hedderly’s pictures of Chelsea Reach and the area by the Greaves boatyard in another post. This is an image I’ve never used before. 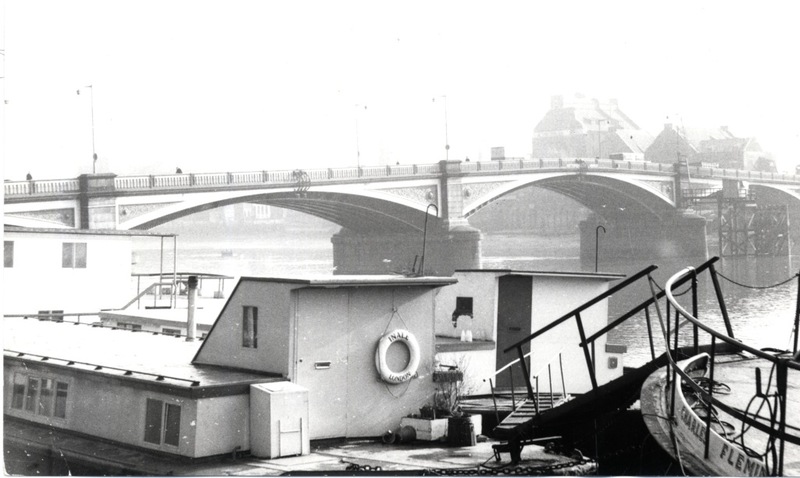 You can tell the direction of the picture from the just visible view of old Battersea Bridge in the distance. 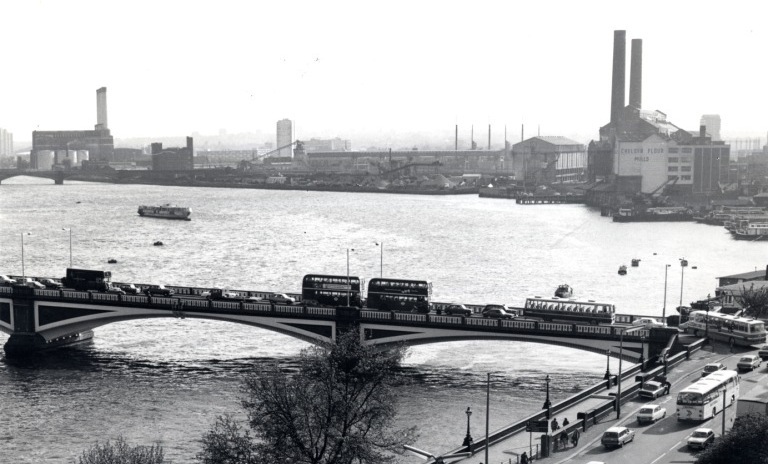 Bignell’s 1965 view shows the current Battersea Bridge being crossed by four buses. The suspension towers of Albert Bridge can also be seen, with Battersea Power station in the distance, a couple of the chimneys visibly smoking. The crucial difference in the hundred years between the pictures is the use being made of Chelsea Reach. 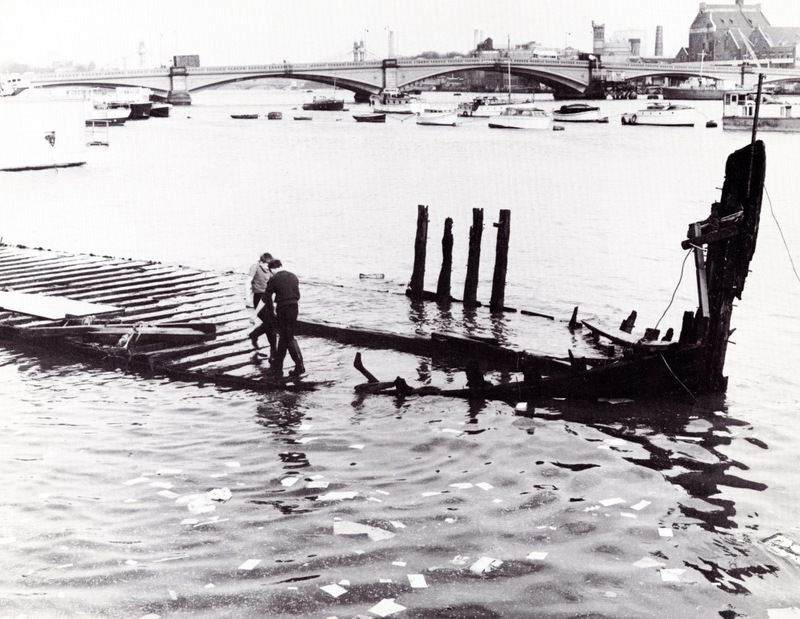 The sailing barges are gone, replaced by houseboats, and the men at work have been supplanted by a pair of daredevils playing around on a nearly sunken barge at high tide. It probably looks more dangerous than it was. Bignell is certainly standing by quietly with his camera, apparently unconcerned. But their mothers wouldn’t have been too happy. This is a view taken from the tower of Chelsea Old Church. 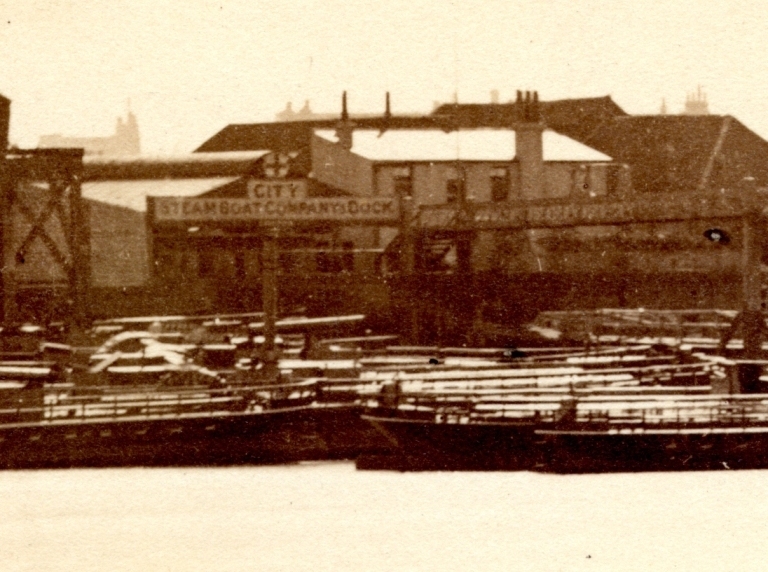 It shows the tangle of closely-packed houses and wharves between Cheyne Walk and Beaufort Street before the embankment. 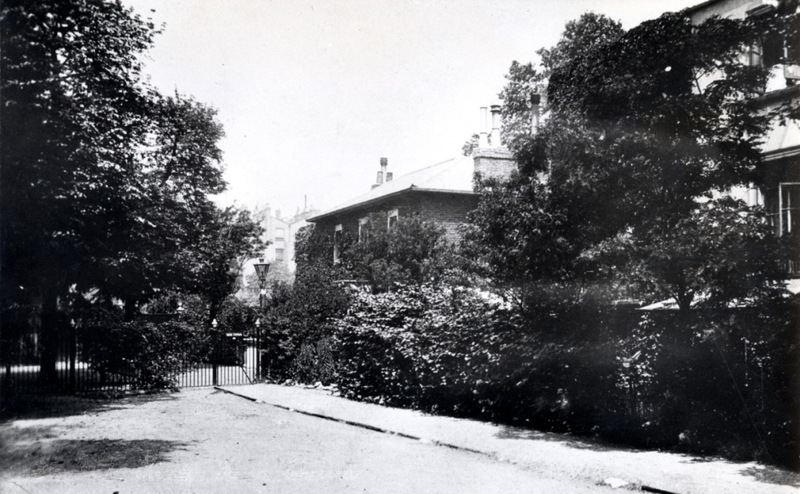 Beyond are the larger house of Lindsey Row and the trees of Cremorne Gardens. Bignell owned a print of this picture and made an enlargement of it. 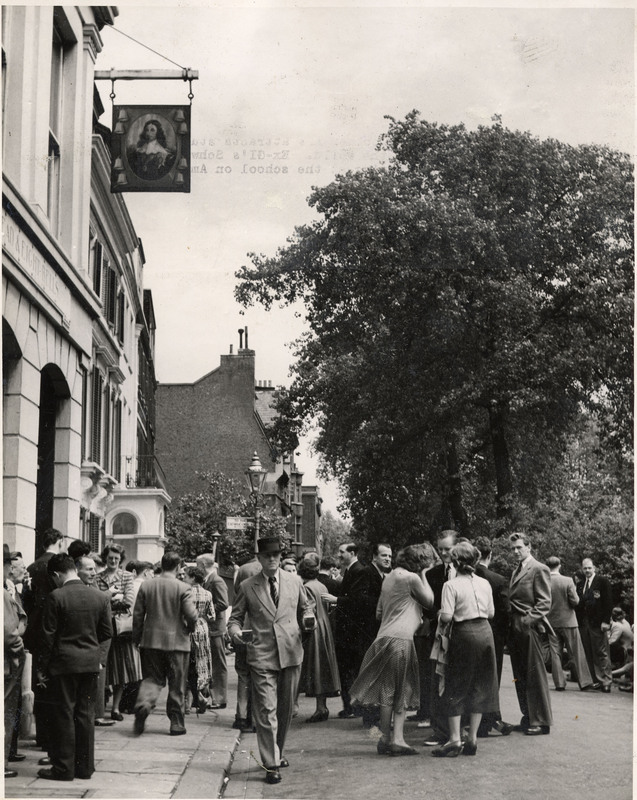 I was examining it this morning imagining myself walking along Lombard Street towards Johnson’s Coal Office and then into Duke Street past the Adam and Eve Tavern. You could cross Beaufort Street and walk along the riverside to the wharf at Cremorne where the boats brought pleasure seekers to the Gardens all the way from London. Is one of those buildings visible in the distance Ashburnham House? 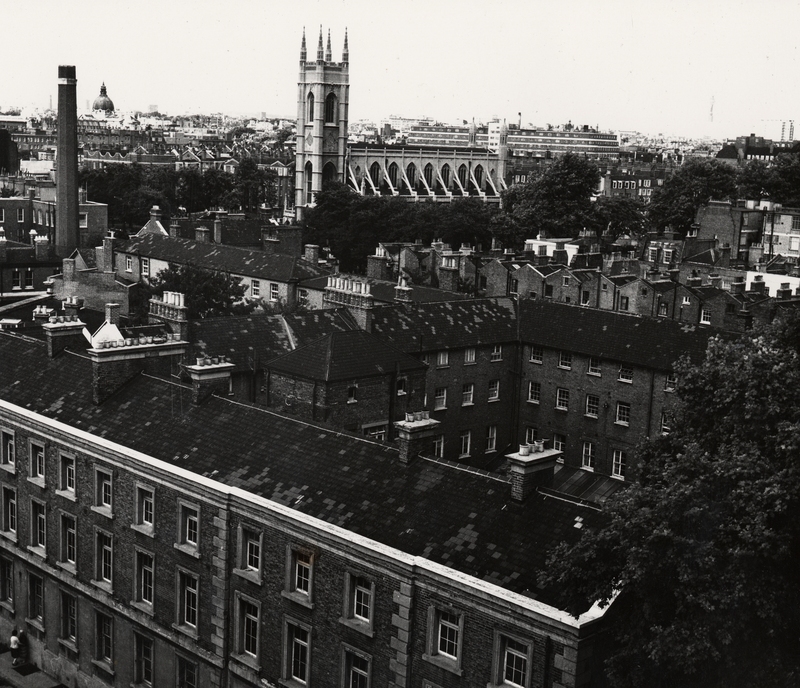 Bignell was so fascinated by this picture that in 1978 he too climbed the tower of Chelsea Old Church (though not of course the same tower, but a meticulously restored copy of the one Hedderly climbed) and took his own picture. 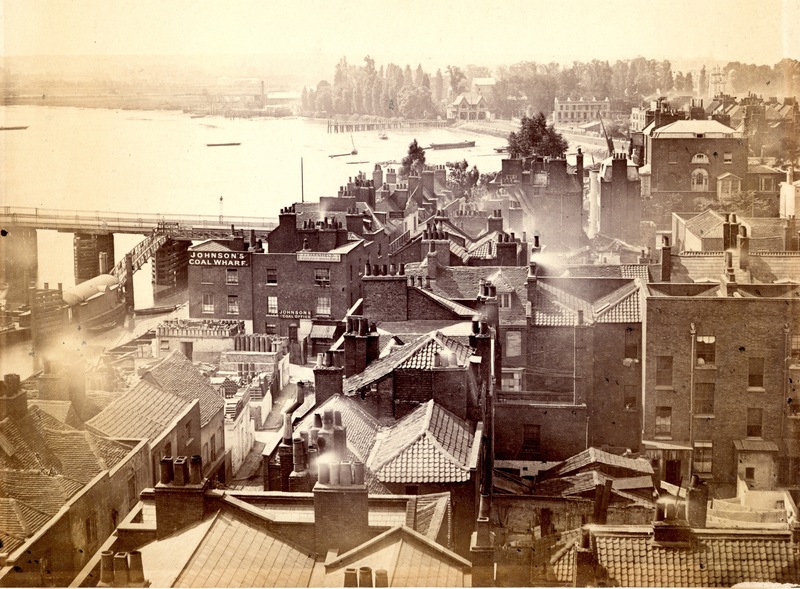 From this vantage point Bignell saw the sunken garden named after Sir Thomas More’s daughter Margaret Roper, the four lanes of Cheyne Walk which now pass right through where the old houses and taverns stood, and part of the old river too. He saw Crosby Hall, transplanted from the City in the1920s and where the pleasure gardens were, the towers of the World’s End Estate. 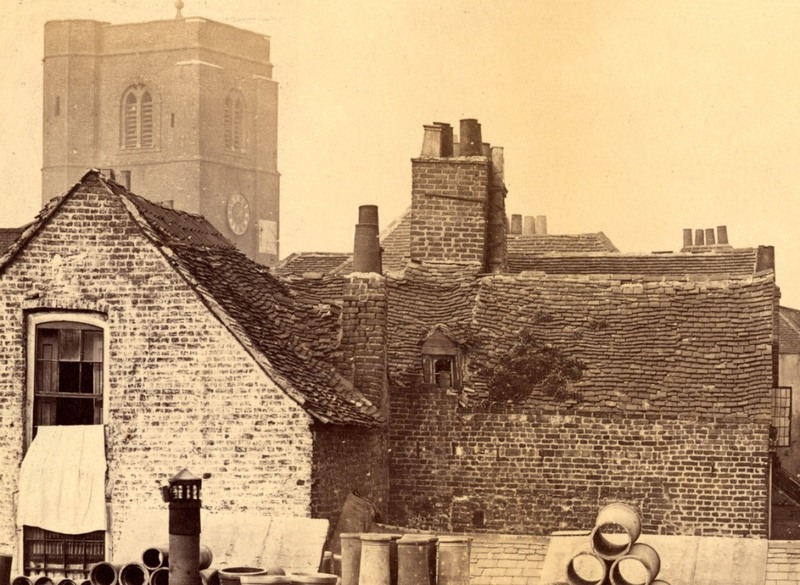 You could barely make out the industrial landscape beyond the gardens in the 1860s picture, just a few chimneys. In 1978 Lots Road Power Station was still generating power and still had two of its chimneys. 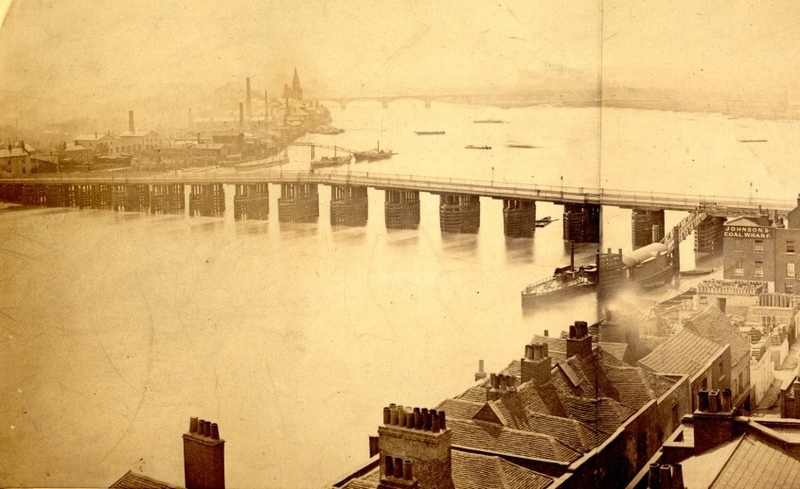 Almost the whole length of the old bridge, and the industrial zone on the Battersea side of the river. Bignell didn’t try to get the whole view in again but his second shot takes in more of the bridge and the area west of the Power Station. Lots Road’s younger cousin Fulham Power Station with its four in line chimneys is on the left of the picture. Bignell had a great reverence for Hedderly’s work and must have felt a connection between them. It’s unlikely that James Hedderly ever imagined the possiblity of that link or realised the great attention which would be paid to his work in the future. What would he have said or thought if he could have seen Bignell’s work and glimpsed some of the sights he would see and the technical possiblities that were to come? The 100th post on the Library Time Machine, a point I must have thought was possible when I started but I couldn’t have imagined how I would get here. The answer of course is just find some pictures every week and write something about them. Sometimes the ideas run three or four posts ahead, sometimes they stretch no further than next week (or less on a few occasions). The other thing I imagined was that I would run out of ideas. It’s true that a lot of the big topics have been covered but only a few of them have been done so thoroughly that I could never go back there again. So we might visit Cremorne Gardens again one of these days or take another look at Marianne Rush or William Burgess. 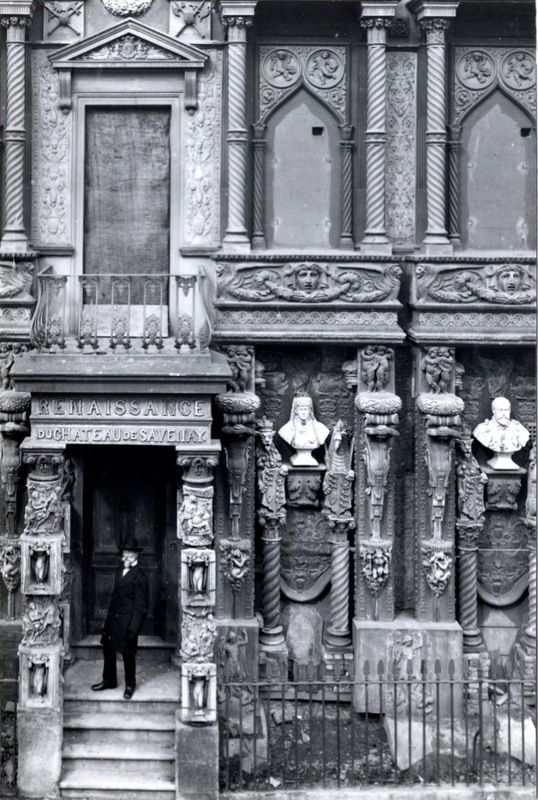 There are even a few unseen Linley Sambourne pictures knocking about on the hard drive. And judging by the continuing popularity of the Duchess of Devonshire’s Costume Ball we’ll almost certainly be going there again . I’ve probably done all I could on Walmer Road and Hurstway Street but there are plenty of other streets to walk down in the past and the present. One or two artists you haven’t seen yet. And yet more forgotten buildings and secret places. So all other things being equal it is just about possible that we might get as far as 200 posts in another eighteen months. The conclusion is that there really is no end to history even in a small (but significant) part of one city, in one country, on one world. This is my 53rd post on this blog, so it’s almost exactly a year since my first post. When I started I wasn’t sure exactly how I would find something to write about every week but I was sure about where I would start. The one subject I knew I wanted to share with you was the photography of James Hedderly. 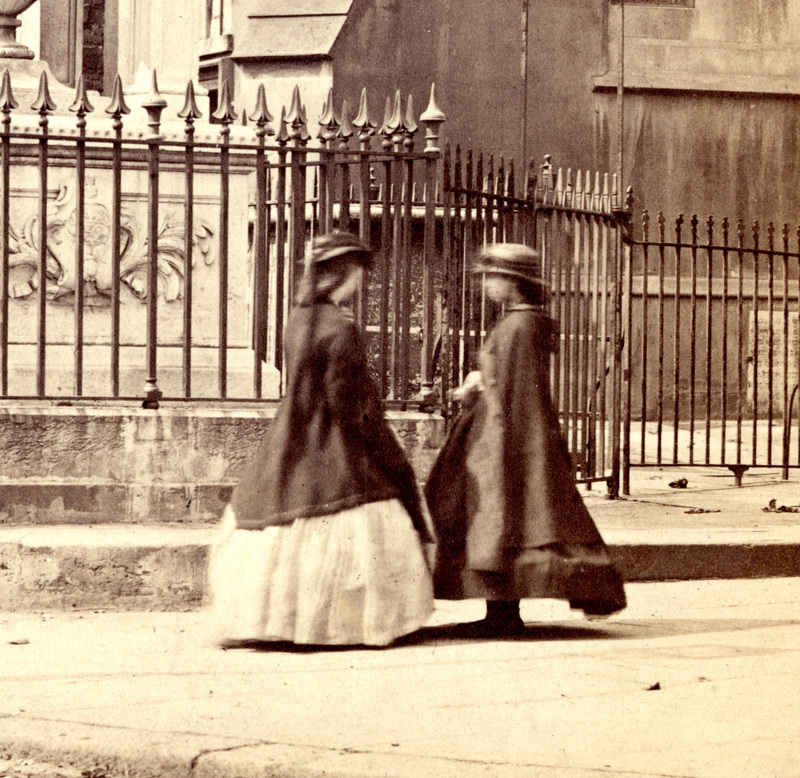 Just after the middle of the 19th century an ordinary man started to haul fifty pounds of complicated equipment around his neighbourhood so he could take photographs. His friends and neighbours humoured him by standing still or just watched him in silent amazement. Or perhaps they realised that they were also participating in something new. They watched him and now we can watch them. So once again we are in Old Church Street facing the Black Lion Tavern. My friend the lady with the basket isn’t here on this occasion but Mr Hedderly has assembled the same mixed bag of people deliberately and accidentally posing for him. The boy slouched against the wall, the guy with curly hair, a bowler hat and what looks like a leather jacket, the boy sitting in the window, the barman in the apron, the stout middle aged man who can’t do his jacket up, a young girl behind him, a couple of smartly dressed younger men with time on their hands, a couple of indistinct figures behind them probably children, a girl who has managed to get into the picture twice by moving just enough and a man just edging into the right side of the picture – quite a cast for a simple daytime picture. They all get our attention. Look long enough and they might all tell their stories. Leave the idle fellows at the tavern and come back down Old Church Street to the river to meet some of the working men. 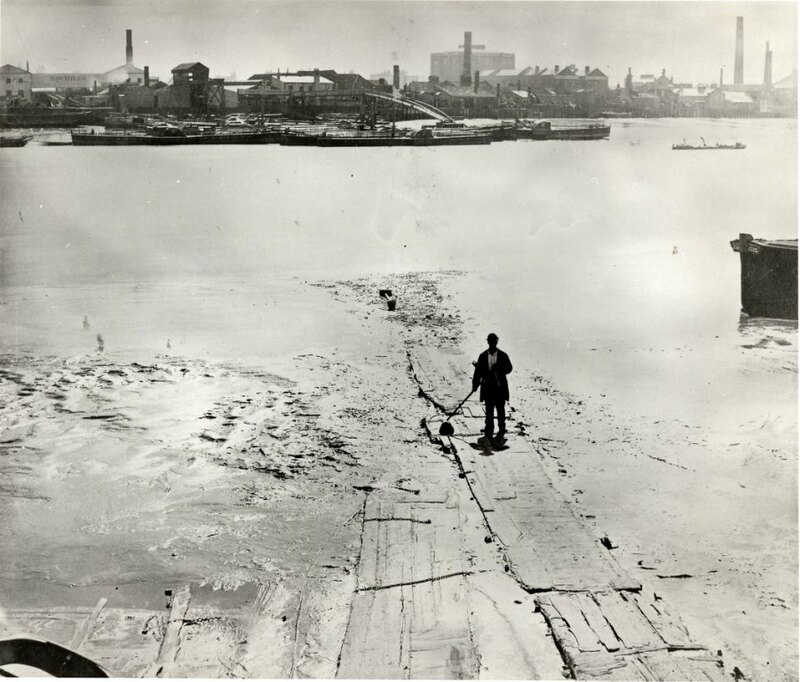 Alldin’s Coal Wharf at low tide. Arch House marked the end of Cheyne Walk at this time. 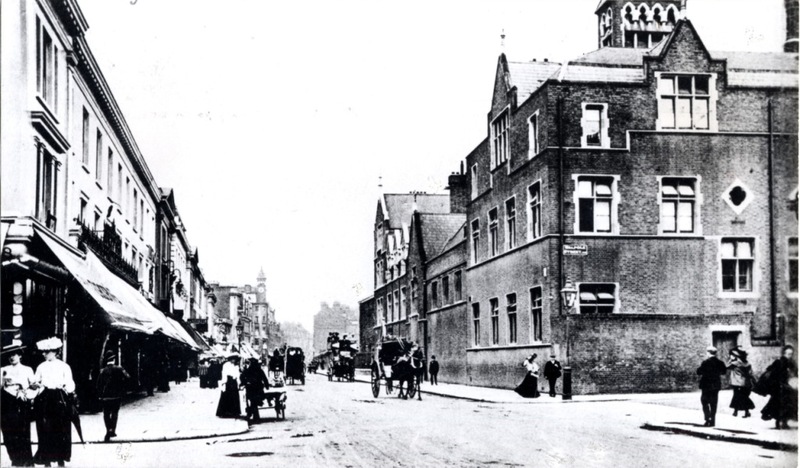 It was a substantial and solid looking building compared to the cramped old houses and shops in Lombard Street and Duke Street which lay behind it. The confident looking man perched on the precarious arrangement of planks looks like management to me, keeping an eye on the staff. 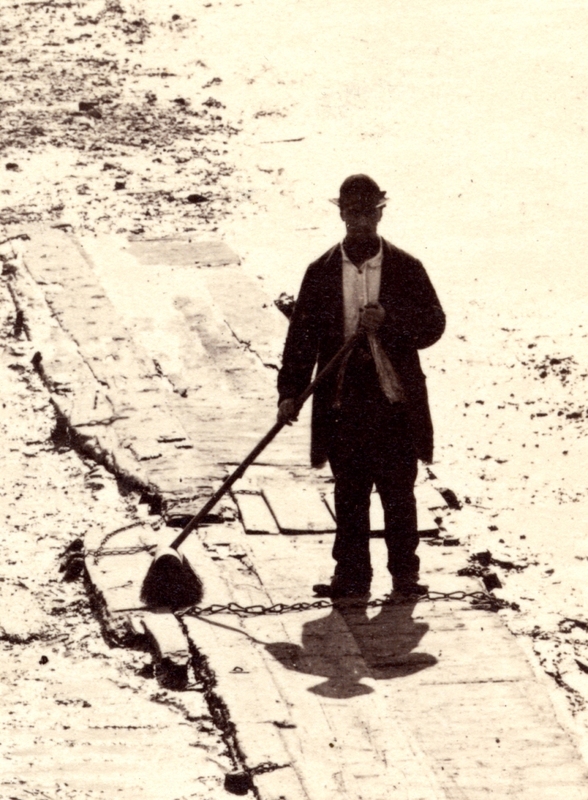 The four men standing on the river bed all carry items related to the coal business – spades, a coke sifter, a coal sack (the man holding the sack looks like a classic coal man, his face grimy with coal dust. The three on the street might be drivers. There’s a man in the window behind them joining the picture. 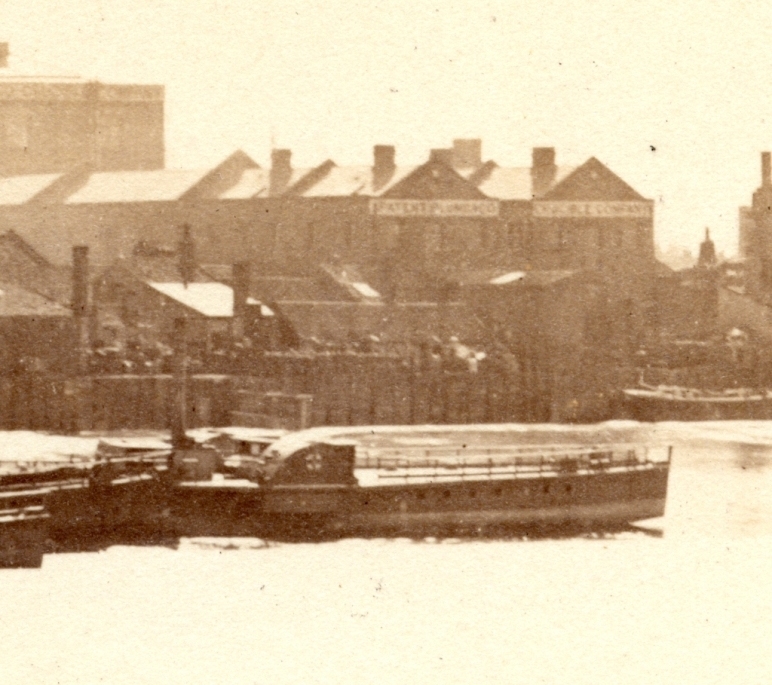 Behind Arch House was Allen’s Lime Wharf. 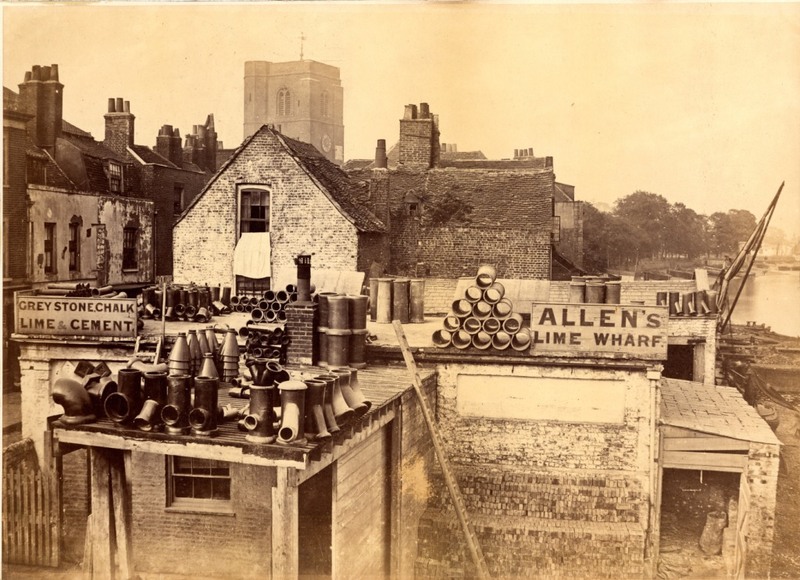 Allen’s was one of the ramshackle collection of buildings on the river bank. You can just see part of Lombard Street on the left and the poor state of the houses in it. Look in close up at the state of the roof of Allen’s. The undulating uneven roof tiles and patches of what looks like moss, the tiny attic window which looks like it is about to fall inwards. The whole house look like it is held together by the dirt of decades. This picture is one of Hedderly’s crispest images and it captures those moments of stillness in what must have been a hectic day. No faces at the window though. I would love to see one of those in a Hedderly picture. Just a few yards away are some more upmarket houses and retail establishments. I can’t quite make out what sort of shop Mr White runs, but Wheeler’s Medical Establishment next door must be some kind of pharmacy. A group of middle class people are posing for Mr Hedderly, or again standing just as mystified as the tavern’s customers. One of the ladies has left a ghostly presence but if you look to the left you will see some even vaguer traces of a couple of men, possibly workers from Alldin’s. And Mr Hedderly gives us another mystery woman standing in the doorway of the house next to White’s, a young woman in indoor clothes drawn outside perhaps by curiosity. 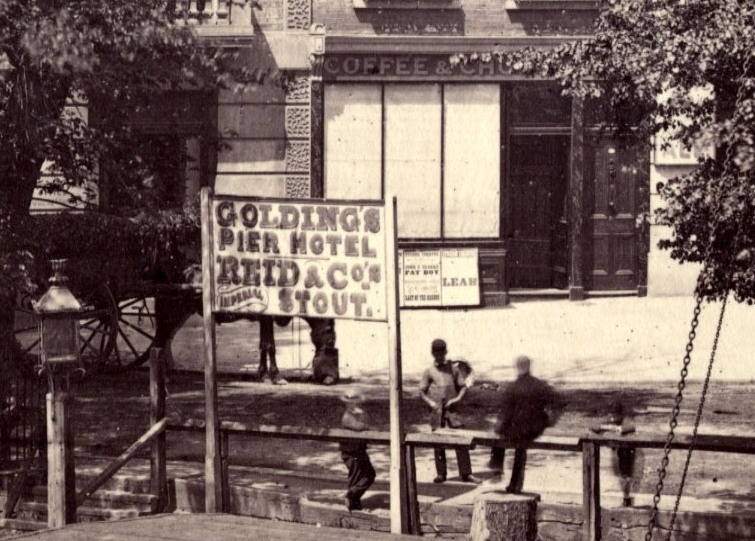 If we head eastwards along Cheyne Walk towards Oakley Street we can see Golding’s Pier Hotel. Next to the Hotel is a coffee house. Look closer. Do you see the billboards outside? Can you make out any of the words? I see Leah, the name of a play perhaps, and the even more enigmatic words Fat Boy. The last picture for today is quite different from the others. I don’t know whether it’s sunlight shining down over the top of the house, or just the limitations of the camera but the light seems to isolate the garden and the solitary figure sitting in it. Who is he? 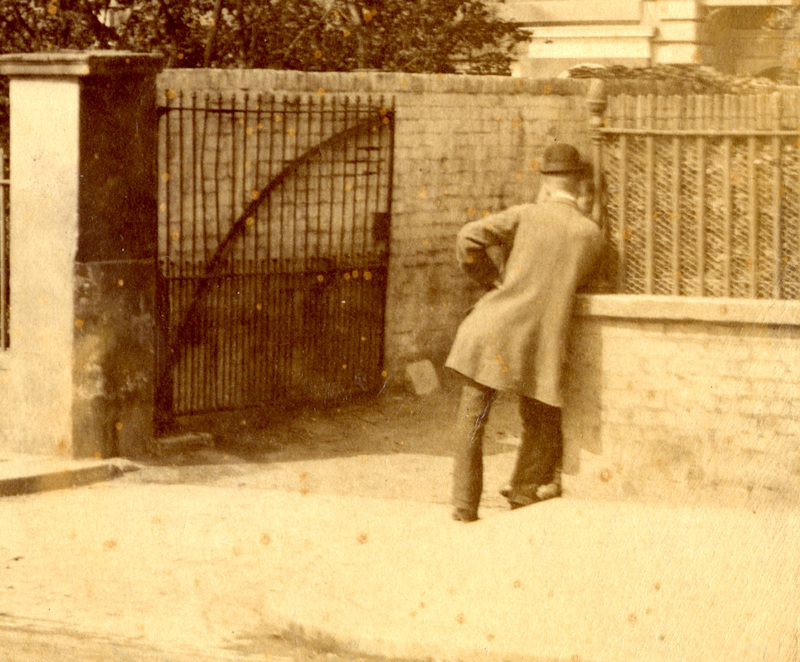 The big clue is the handwritten caption – back of Rossetti’s house. 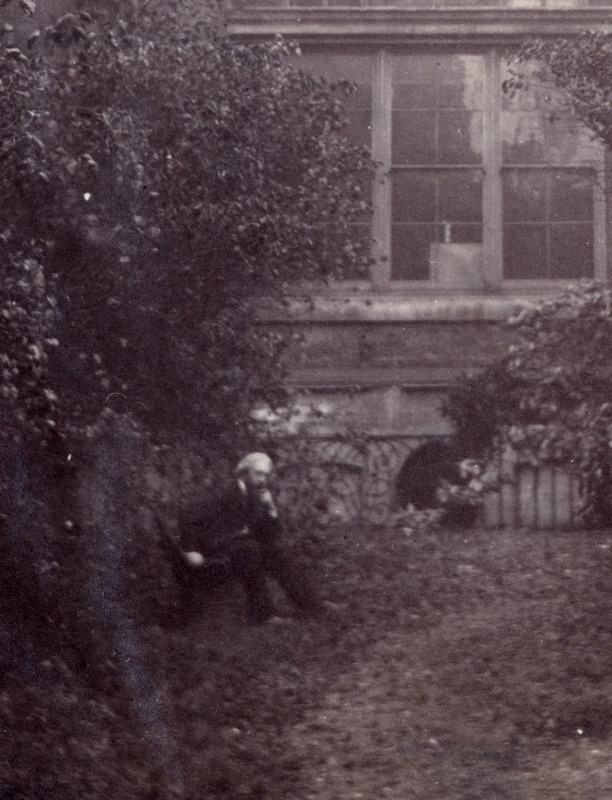 Rather than try to puzzle out whether it’s Rossetti himself or his brother William the question I wish could be answered is how did Mr Hedderly and his camera find their way there? Go on then. One last close up. 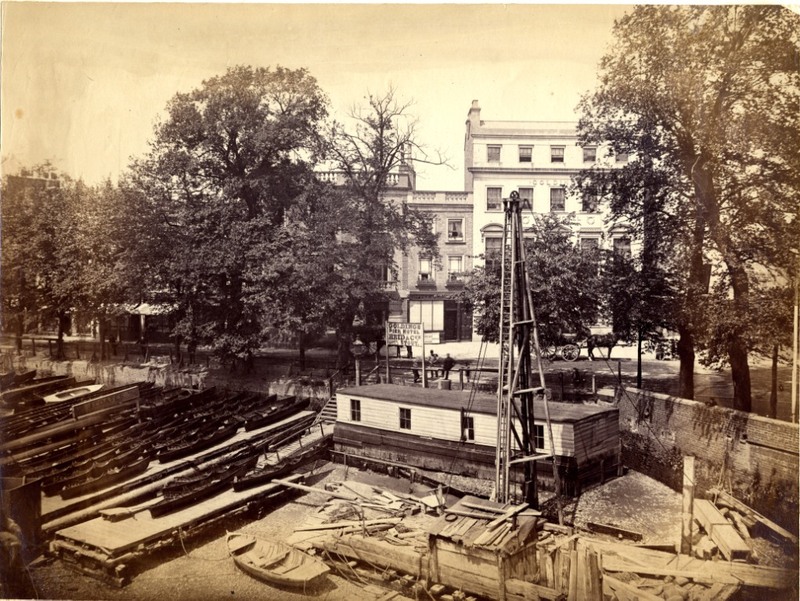 We’ve seen the riverside at Chelsea in its pre-Embankment days documented by James Hedderly and others but this week’s pictures were all taken after the construction of the Chelsea Embankment. 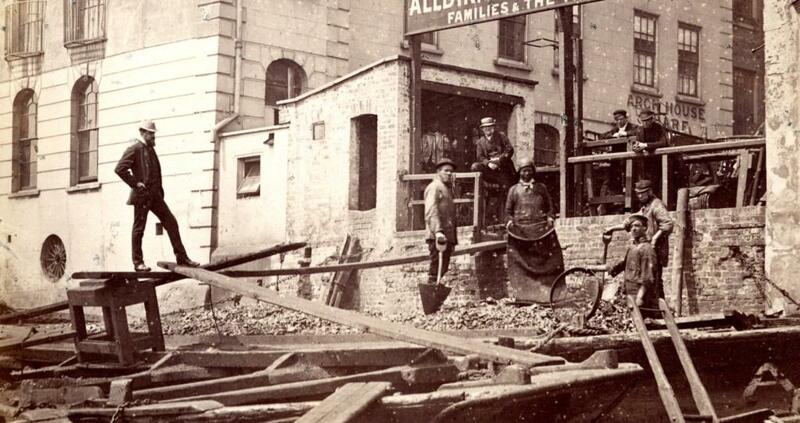 Duke Street and Lombard Street were swept away and the picturesque jumble of houses and taverns facing directly onto the river were demolished. 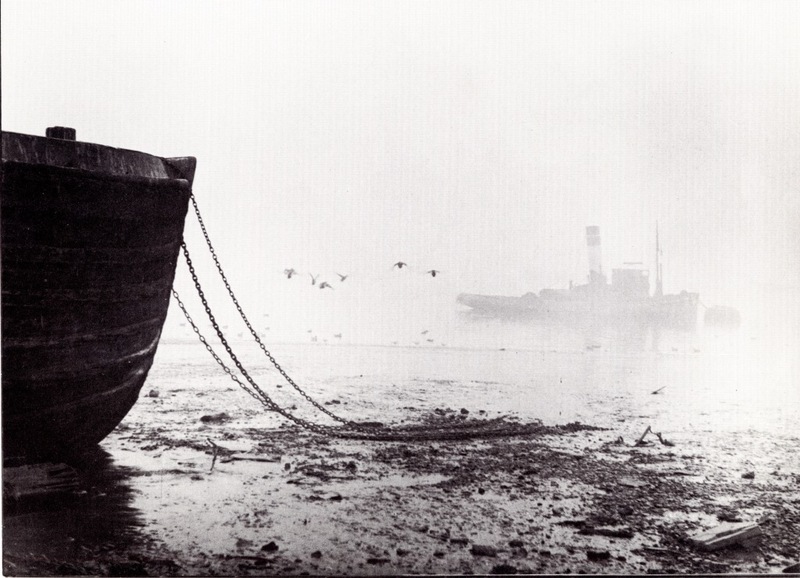 This picture looks across the river towards the industrial landscape of Battersea. We’ll look more closely at that in a moment but look at our man first. He’s standing on the river bed at high tide. That walkway is still there today and many years ago when I was more agile than I am today I climbed down and stood where he is standing. I wouldn’t recommend it, and I imagine the ladder you could use then is better protected today. I’m not sure what he’s doing. 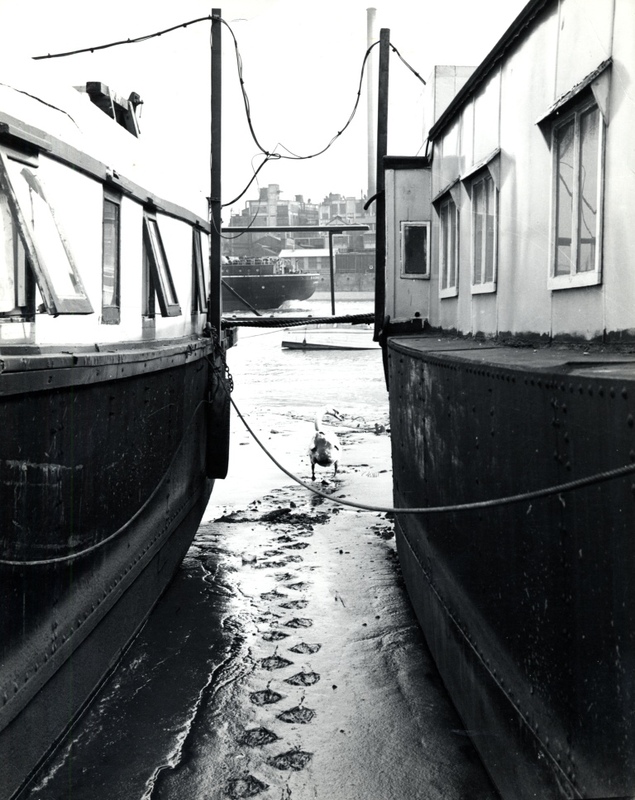 There are chains down there, mooring points for barges perhaps and he might be clearing mud from the walkway. Victorian industry was labour intensive. The cheapest way to do something was to get a person to do it with the simplest tools to hand. He had a moment anyway to look up at the camera. 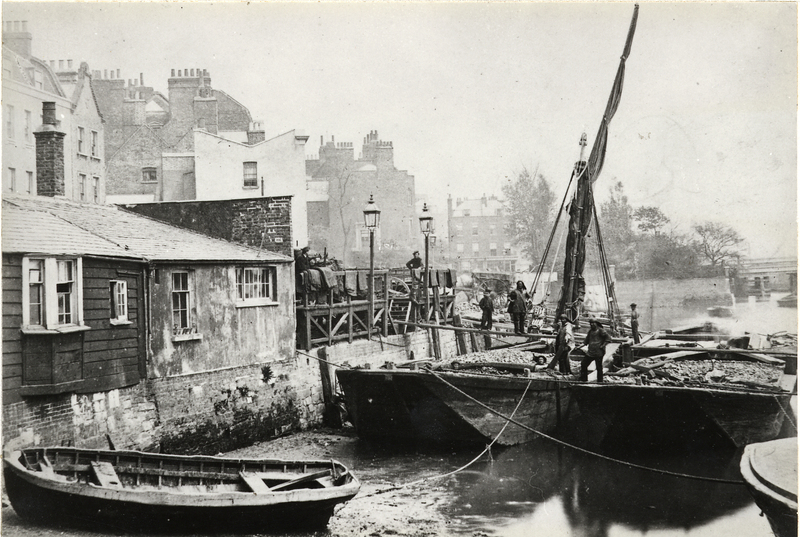 Across the river there is no embankment but rather than the houses and small wharves of the Chelsea side you see moorings for large barges with spindly piers reaching out to them. Warehouses, chimneys, a saw mill. There is a barely visible lock on the left I think behind which there was a creek with access to more industrial spaces. 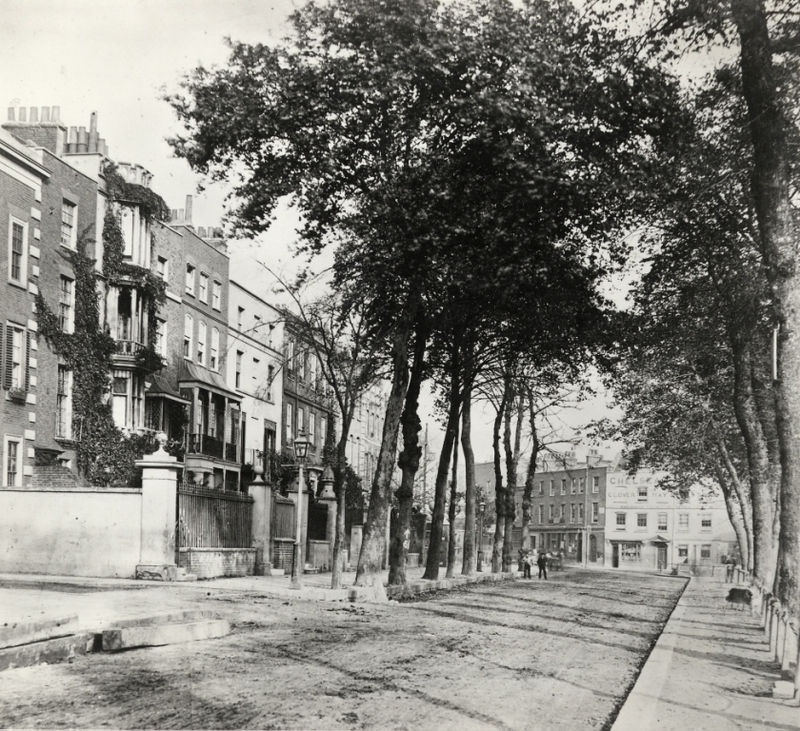 The former site of Lombard Street is now part of Cheyne Walk although the shops on the northern side have survived. Mr Spells (and his daughter?) also have time to pose for Mr Hedderly. No-one thought to clean up the horse manure which is quite visible in the foreground. It was probably a constant for passers-by. You can make out the well-stocked windows and the sign on left which you can read the words Savings Bank but not the whole message. The white building is our old friend Maunders’ Fish Shop. 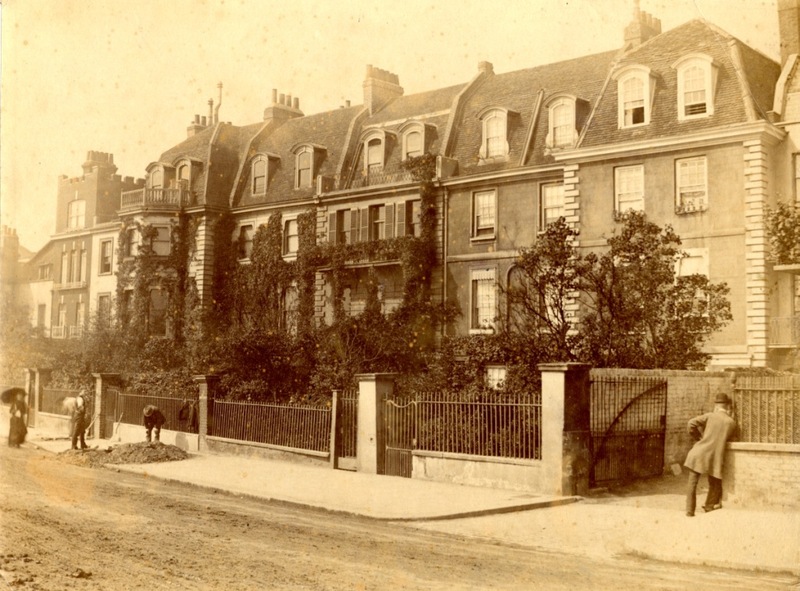 This view looking back westwards shows one of the new gardens built after the Embankment and the parade of shops called Lombard Terrace. This is one of the best views of the Old Church. It looks as though there is early morning mist – a pleasing effect but I have to admit to covering up some chemical decomposition by converting the picture to greyscale. I still like it though. 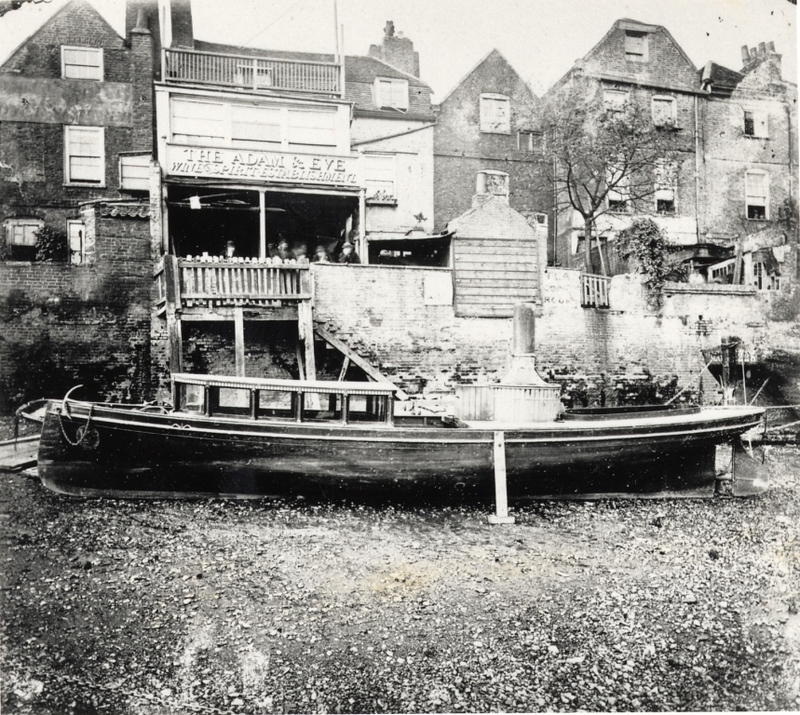 The King’s Head and Eight Bells with a crowd of shop keepers and other interested parties, all maintaining their poses, perhaps encouraged by the two policemen. The street sign for Cheyne Row is quite visible. Behind the trees you can see the grand house of Cheyne Walk but in the foreground timber is waiting for loading or unloading, together with a piece of casual advertising aimed at passing boat traffic. 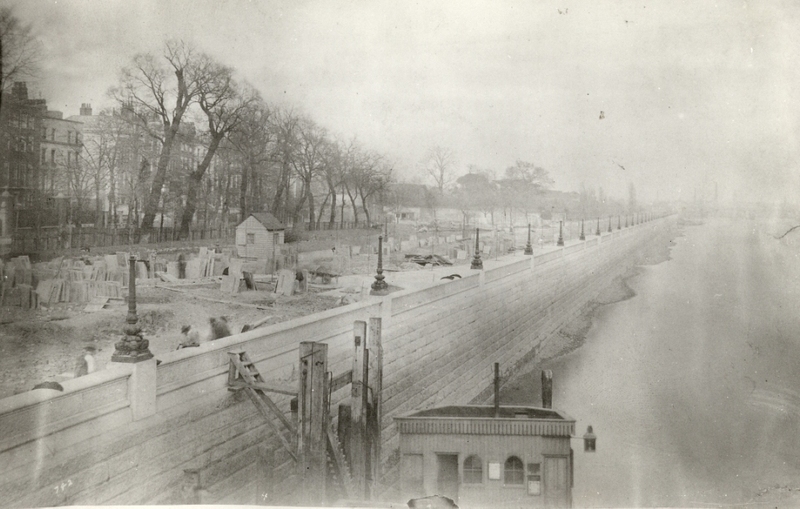 We can’t leave the new riverside without a slightly earlier view of the Embankment under construction. You can see how much land was gained. 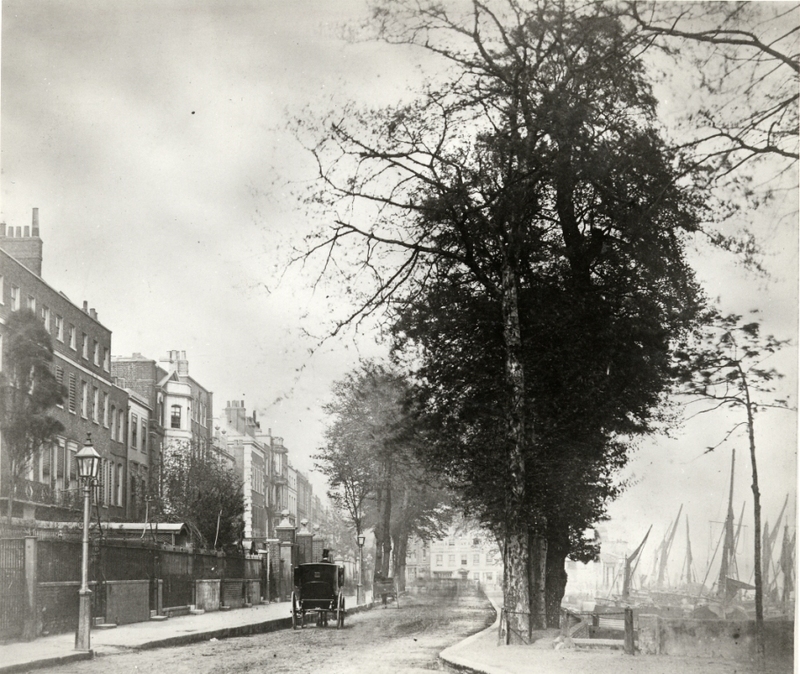 Cheyne Walk became a wide new highway instead of a semi-rural riverside track. 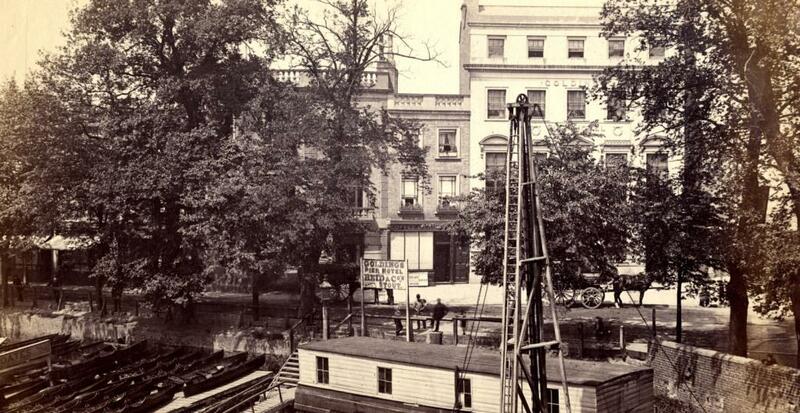 Chelsea became part of Central London, losing some of its qualities as a picturesque backwater. Ironically just as this was happening the focus of commercial life was moving north towards the King’s Road. I left you last week in Chelsea Reach among the boatyards and wharves at the western end of that stretch of the river. 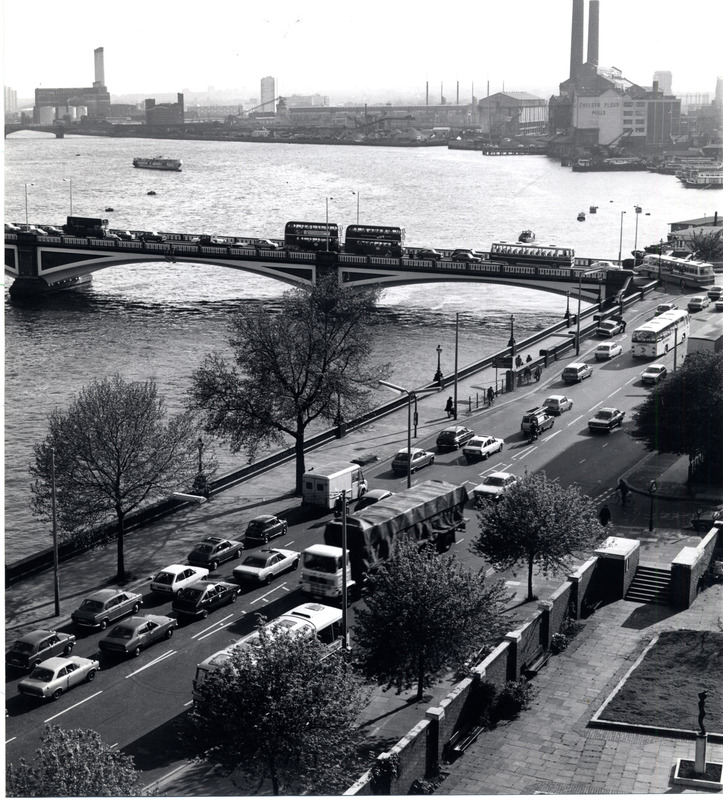 This photograph shows the intersection with Beaufort Street (then called Beaufort Row) at Battersea Bridge. 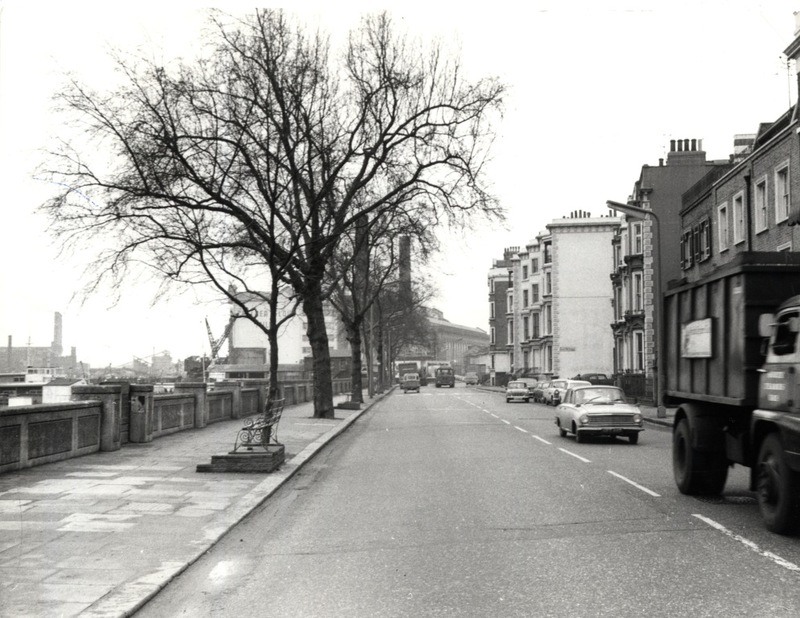 The road called Lindsey Row leads west towards Cremorne Gardens, advertised on the board at the left of the picture. 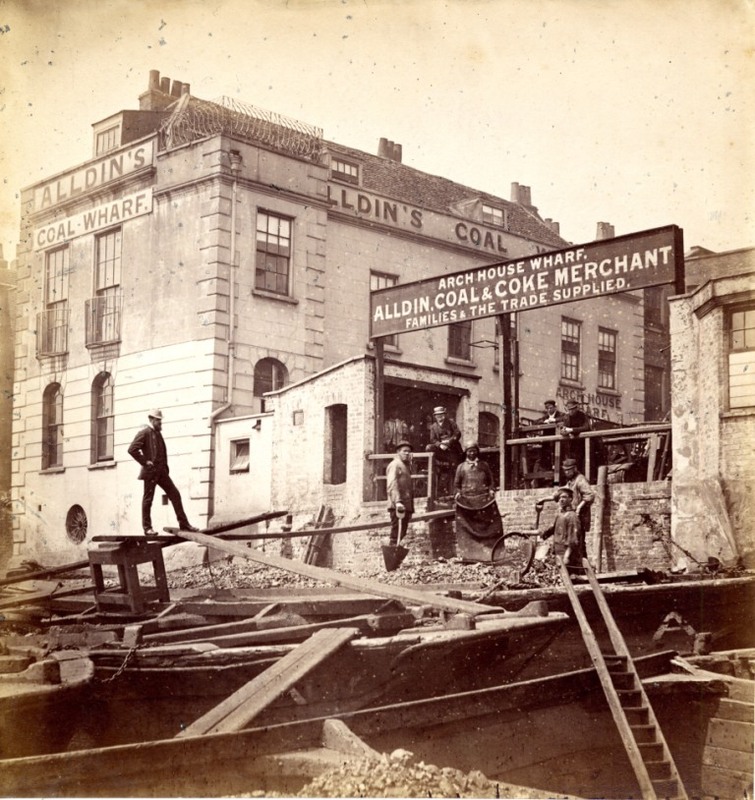 (“Cremorne open daily, one shilling” – I can’t quite make out the opening time) To the right of the board you can see another sign proclaiming the existence of Greaves and son, boat builders. The house nearest the camera is Belle Vue House, one of the grandest in the neighbourhood. 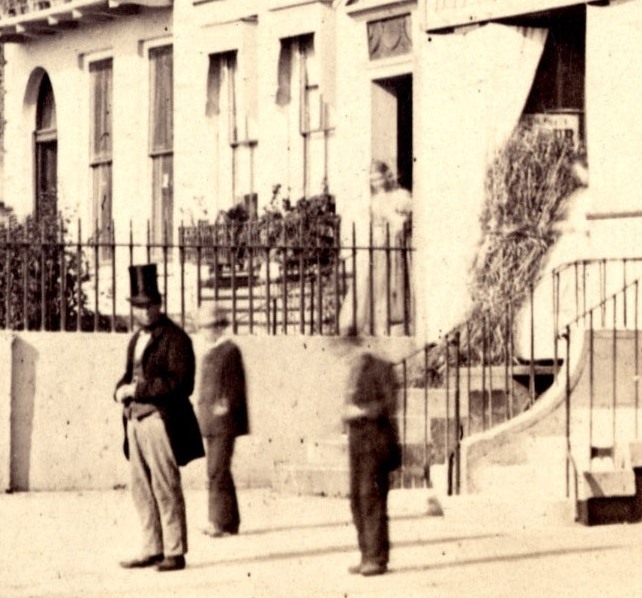 Its eminence has not deterred the three men leaning against the railings who are obligingly posing for Mr Hedderly. I imagine them as a trio of idle fellows hanging around for want of anything better to do. Does the one on the right lack a leg? They are keeping a wary eye on Hedderly. Or perhaps they’re friends of his. 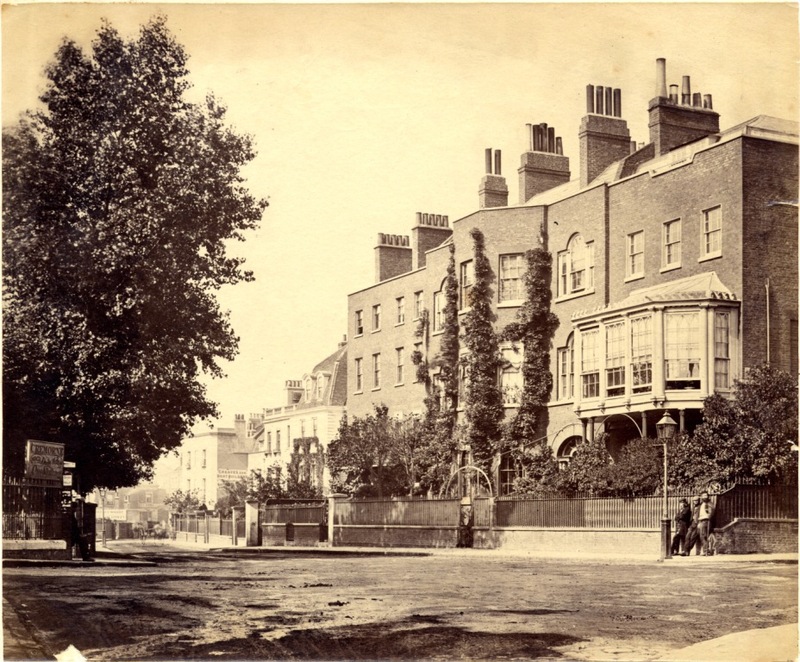 If we cross the road heading east we enter the narrow passage of Lombard and Duke Streets which link Beaufort Street with Cheyne Walk. You can see some images of these streets in my Famous Fish Shop post (see list of posts opposite). 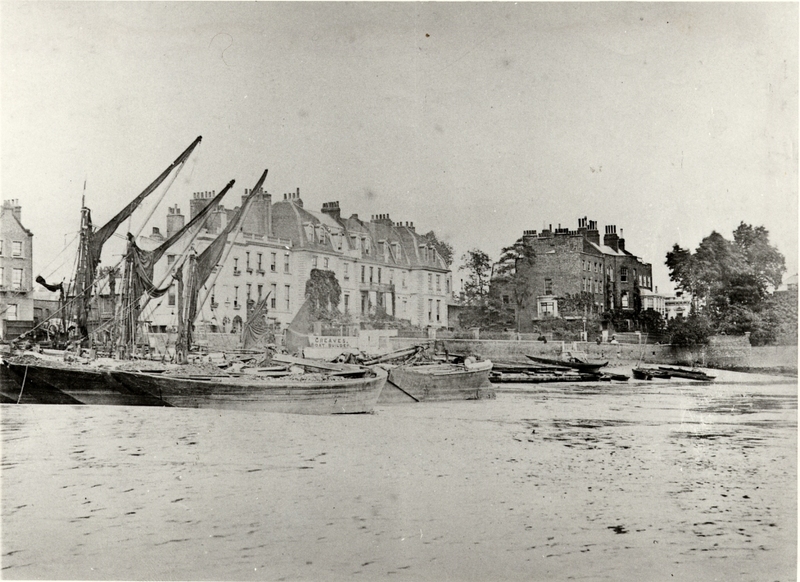 This photograph shows the view from the river taken from the bridge at low tide with the river entrance to the Adam and Eve tavern . It looks a bit ramshackle amid the haphazard arrangement of buildings which all backed precariously onto the river. Beyond this section the riverside opens up in the area near the Old Church. 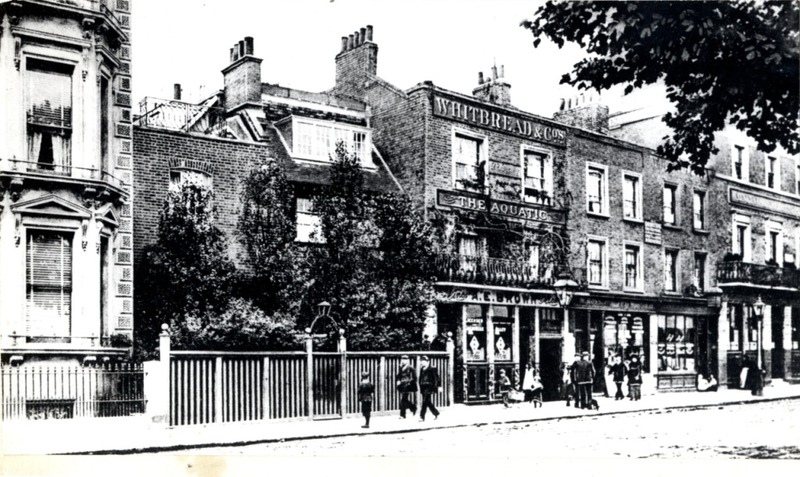 The man on the left is standing outside the King’s Head public house. The fence marks the bank of the river. Boats rest on the mud and shingle. 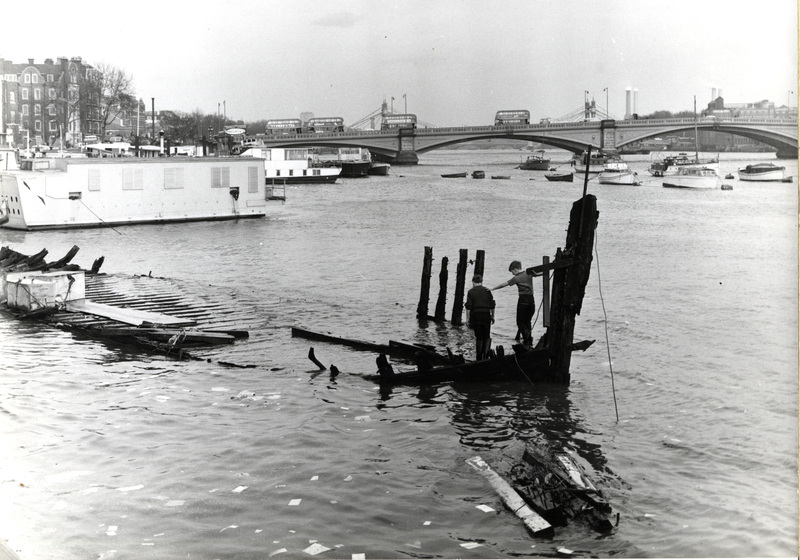 It’s possible the waters crept up onto the road at particularly high tides as they still do occasionally today at Putney. Their dress helps us date the picture to the early 1860s. The one on the right has a shorter dress so she is probably younger. They might be mother and daughter or sisters. You can only get so much detail out of photographs like these. You wish the younger one had kept her head slightly more still. Further down Cheyne Walk the houses become bigger and more palatial as we approach the intersection with Royal Hospital Road. 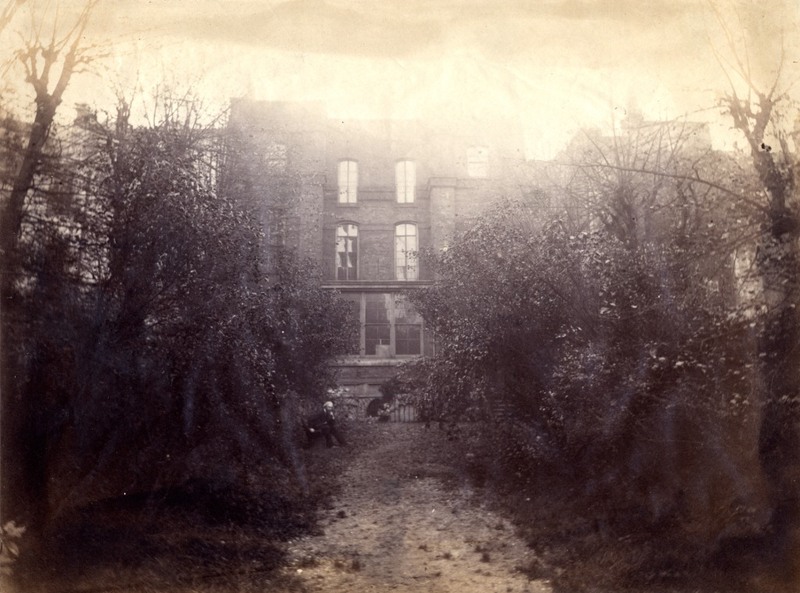 The painter and poet Dante Gabriel Rossetti lived in one of the houses in this photograph. There are still many working boats visible here and more wharves further east. At the end of the road you can see a number of business premises but even high resolution scanning can’t tell us the name of the establishment in the pale building apart from the word Chelsea. The next photograph is one of my favourites by Hedderly. It’s an interesting view of the houses and some road works but look at the dude on the right (I think that’s the right word for him). What’s he up to, in his stylish coat and bowler hat? Can you make out the person he’s talking to? It looks to me like he’s chatting up some young woman, possibly a maid from one of the big houses, if that doesn’t sound too Downton Abbey (or more accurately Upstairs Downstairs). Despite the technical limitations of their equipment I think the early photographers like Hedderly already understood the artistic possibilities of their new medium. The portrait, the posed group photo, the naturalistic views of people and places. And in this case the candid photograph when the photographer catches someone unaware that they are being observed. So this man’s casual actions are preserved forever to show again that people in the past behaved in much the same way as they do today. The name of course is Greaves. 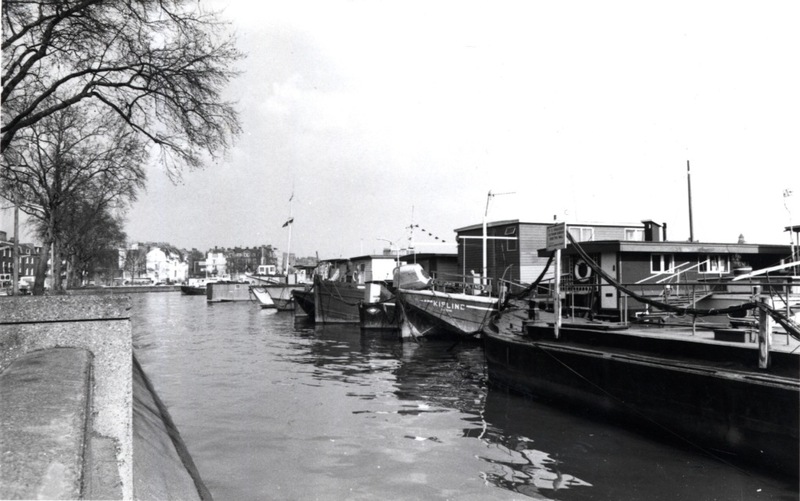 This is the family business of Walter and Henry Greaves, amateur artists as well as boatmen. The street behind the wall looks calm and prosperous, the passersby are unhurried. This is a quiet residential stretch of the riverside. 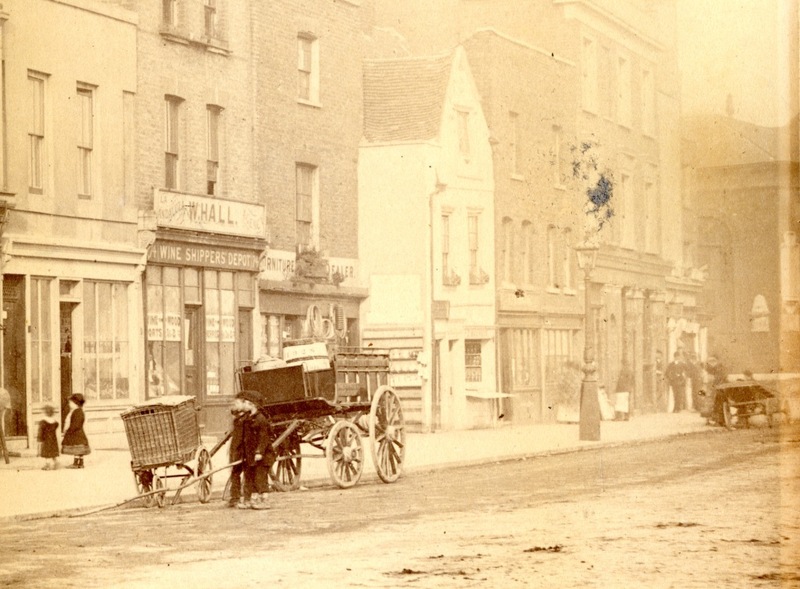 The tightly packed shops and taverns of Lombard Street/ Duke Street are just out of shot. To the left the road leads to Cremorne Gardens. But no-one is in a hurry to get there this morning. A man sits on the wall. Could that be one of the Greaves brothers themselves keeping a eye on James Hedderly, who has carried all his photographic equipment onto the muddy river bed? 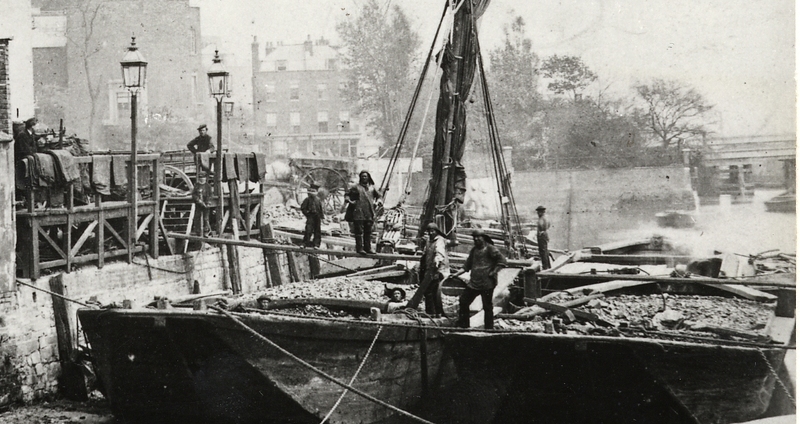 We think they were acquainted maybe even friends as fellow tradesmen of Chelsea’s riverside. (Hedderly was a sign writer at this point in his life). In the background you can see the old Battersea Bridge looking ethereal, although this is probably due to the quality of the photograph rather than weather conditions on the day. Just behind the boats to let sign is another for Lindsey Wharf. 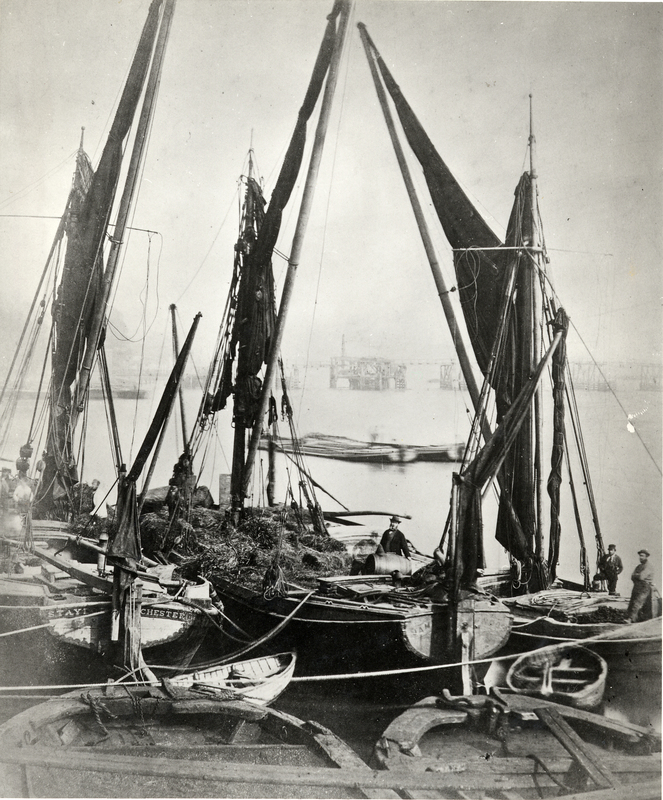 The boats built and rented out by the Greaves family were mostly rowing boats. The brothers rowed customers out on the river themselves. 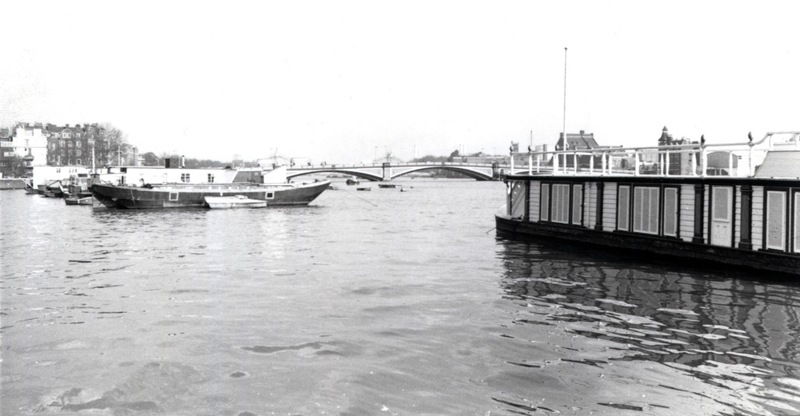 Some of those trips were purely business, taking passengers to their destinations like river taxis as boatmen on the Thames have done for centuries. But Chelsea was already a place for artists and some of the passengers were making sketches of what they saw from the river. One of those customers was James McNeill Whistler who would have a profound effect on the lives of the Greaves family. 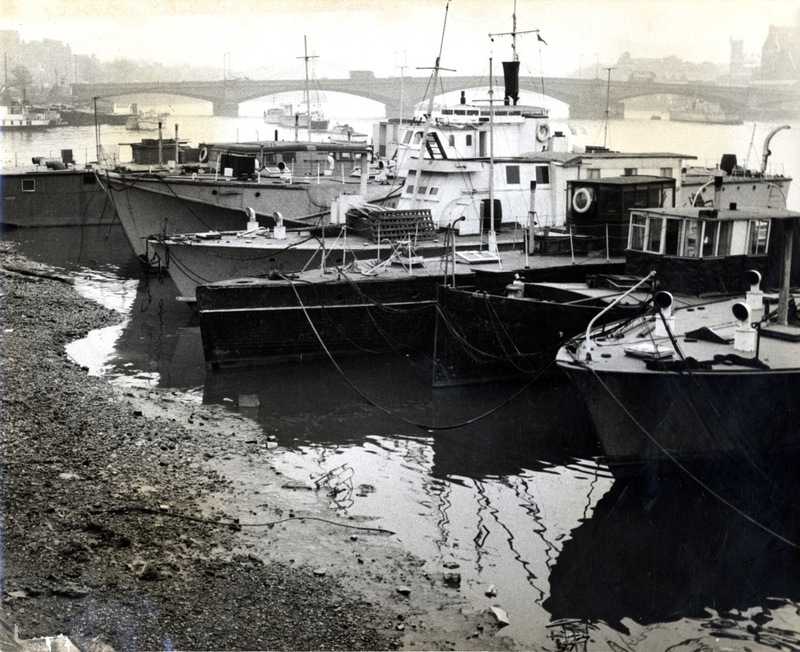 This is a view at low tide probably taken from the bridge, shows what must have been the whole of the Greaves business, the narrow rowing boats sitting on pontoons waiting for customers. 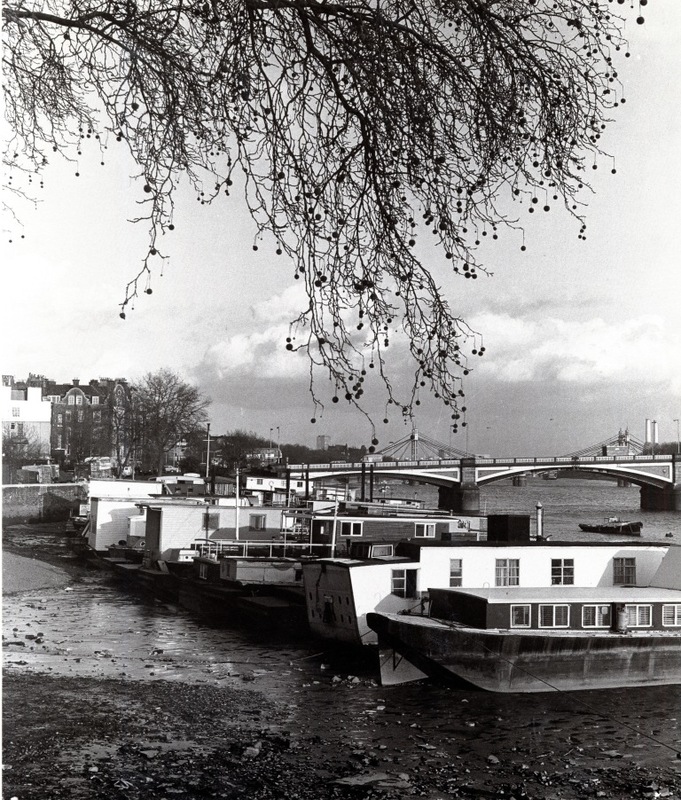 When I started writing this post I intended to take you all the way along Chelsea’s riverside, but we seem to have lingered in one small stretch of water. Perhaps it’s the spell of the river or perhaps post-Christmas languor. Either way we’ll be back here again before too long both with Mr Hedderly and the Greaves family. I hope you all had a happy Christmas.